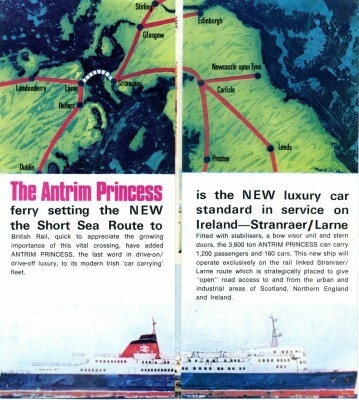 The Stranraer-Larne route was always at the forefront of the story of car ferries around the British Isles, with the very first drive on/drive off ship to serve open waters from these islands being introduced there as far back as 1939 in the shape of the first Princess Victoria. 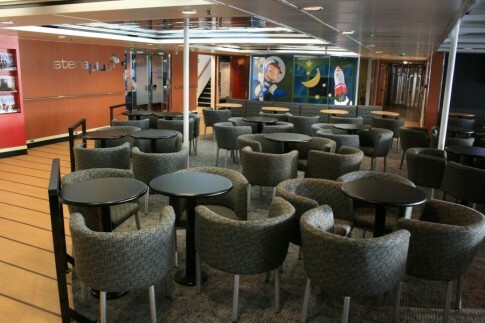 That vessel was a war casualty, but was soon replaced by a virtual repeat, the second-named Princess Victoria of 1947. The sad loss of this ship with 133 lives in the January 1953 storms did not deter the route’s ultimate owners, by this stage British Railways (through the Caledonian Steam Packet), from investing further significant amounts in new tonnage in due course. It is quite remarkable that, despite the booming traffic from Southern England to the continent, over the twenty-three years including and after the introduction of the Caledonian Princess in 1961 until privatisation in 1984, no BR/Sealink ports received more purpose-built British ships than Stranraer and Larne with, in succession, the Antrim Princess (1967), Ailsa Princess (1971) and Galloway Princess (1980). 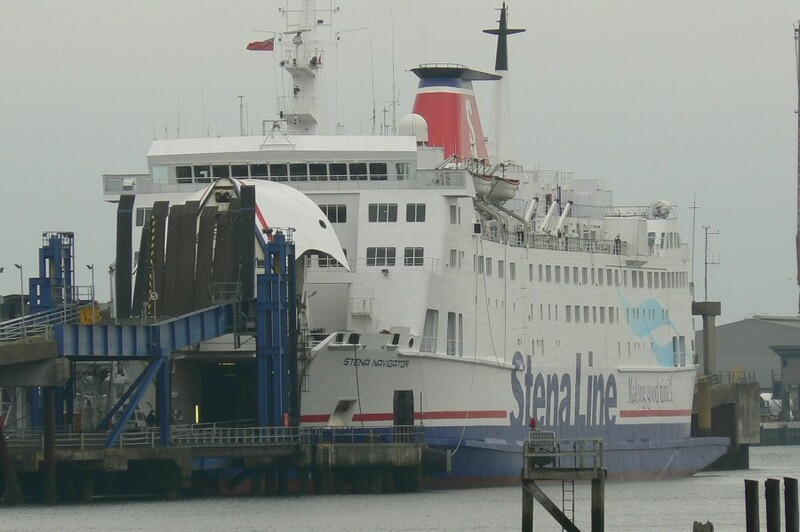 The Antrim Princess joined the Caledonian Princess and chartered Stena Nordica at Stranraer - in the end the new ship replaced the former vessel, with the 'Nordica' remaining on charter for a further three and a half years. 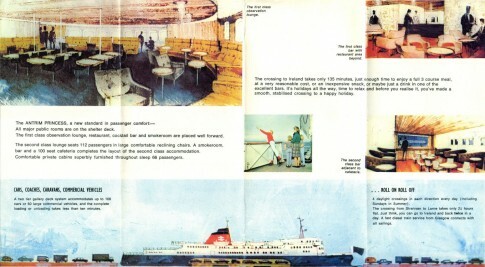 The two existing vessels are shown here in a 1966 brochure. 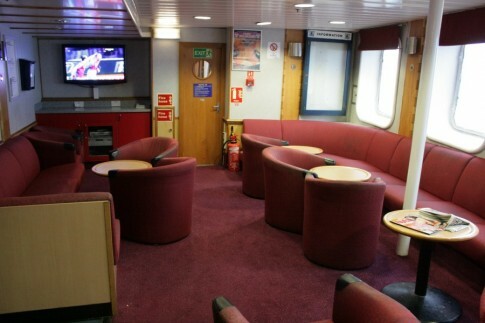 All the listed ships were notable in their own ways, but the Antrim Princess, built by Hawthorn, Leslie on the Tyne, stands out as a landmark for British Rail ferry design. Although the Princesses Victoria had been motor ships, based on the preferences of the original designers and owners (the LMS), since nationalisation in 1948 British Railways had consistently chosen steam turbine propulsion. 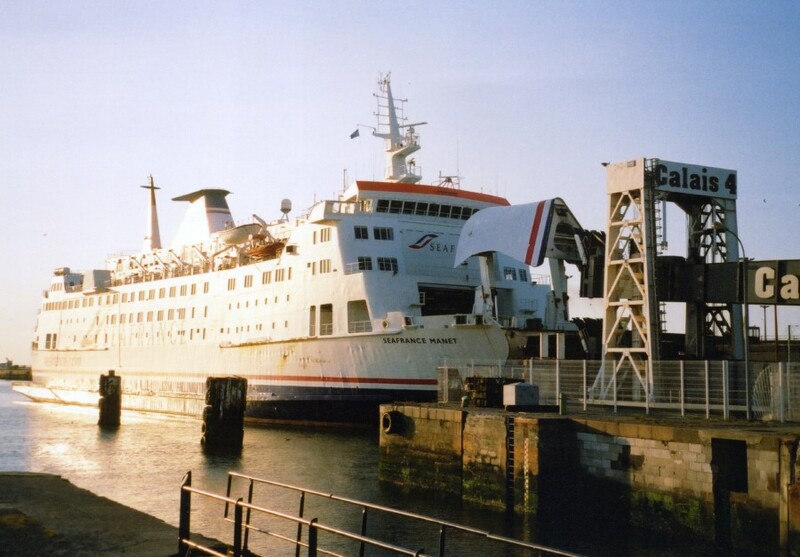 The ‘Antrim’ broke the mould in this respect, and was also the first drive-through BR vessel, complete with lifting bow visor, although in this she followed the lead of the futuristic Stena Nordica which had served on charter to the CSP since 1966. 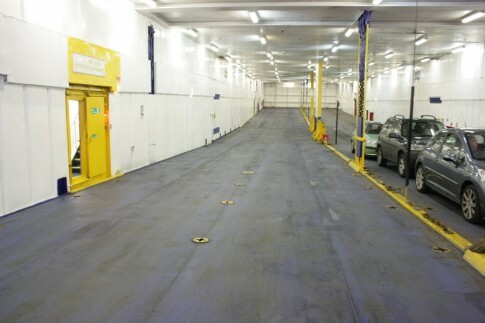 The car deck was full-height for lorries throughout and featured mezzanine decks on either beam – an interesting and possibly unique solution for a ship with a centre casing, presumably requiring motorists wishing to access the accommodation to walk along the mezzanines, down the ramps, across the main vehicle deck and up through the stairwells on the centreline. As with the Caledonian Princess the ship had cattle pens located aft on Lower Deck (beneath, but accessed from, the vehicle deck). 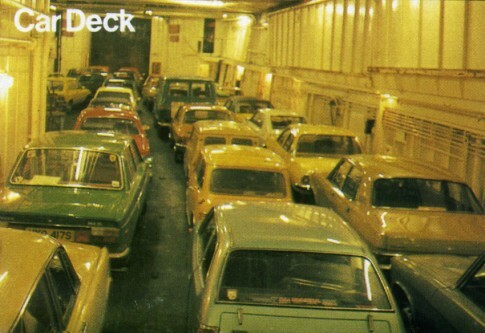 Although the ship was clearly designed with car and road freight traffic at the forefront, she retained a two-class layout on board, reflecting in part the railway aspect of her operations and the connecting trains that met sailings at either port. She has been noted as being slightly less opulent than the Caledonian Princess, clearly a move towards the robust but still elegant designs produced by Ward & Austin through the 1970s. 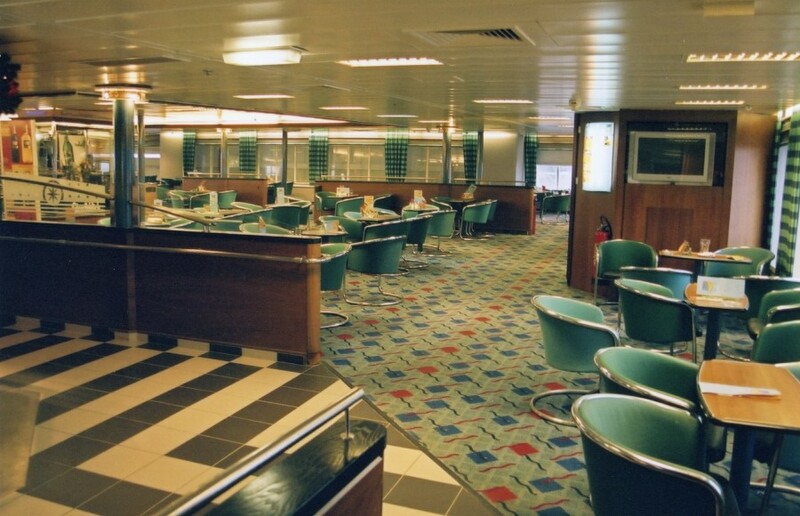 The passenger saloons were spread across the Shelter Deck, with Second Class towards the stern – right aft a Tea Room, aft lounge and amidships a cafeteria (port) and bar (starboard). 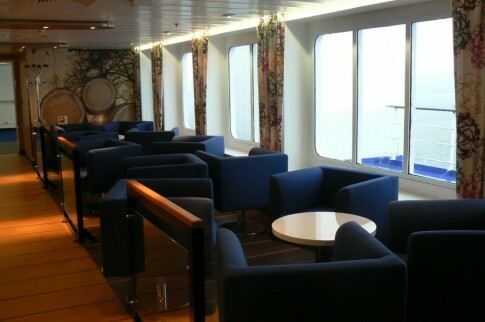 The First Class spaces comprised an oval-shaped lounge forward, with a restaurant (port) and bar tucked in just astern. 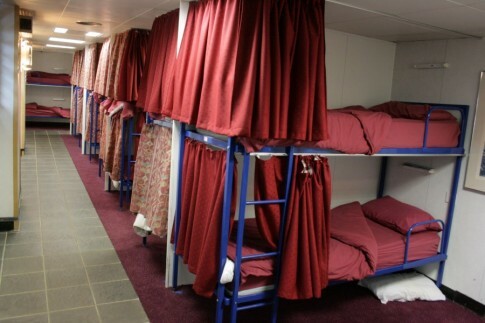 Berths for 66 were available, mostly beneath the car deck on either side of the engine room (First Class forward and Second Class aft), and, in line with existing practice, passengers booking these on late night or early morning crossings were permitted to stay on board overnight either before or after the crossing. Some of the decor presaged that of later Sealink ships, particularly the Vortigern whose dramatic Britannia Bar was in many ways a tidied-up repeat of the Antrim Princess’ Second Class Bar with rather more expensive furnishings. 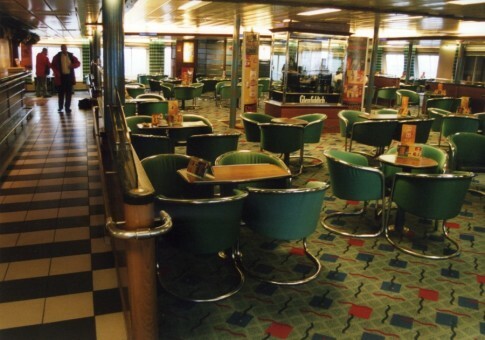 The oval-shaped First Class lounge meanwhile had an echo in the shape of the Vortigern’s minimalist forward cafeteria. 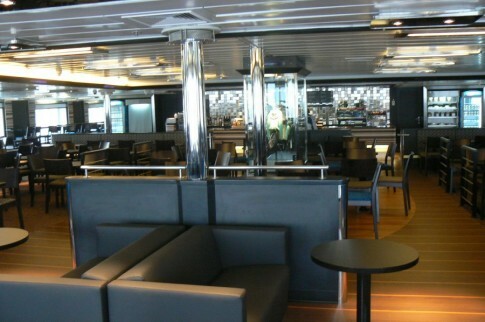 The Second Class Bar, as completed. 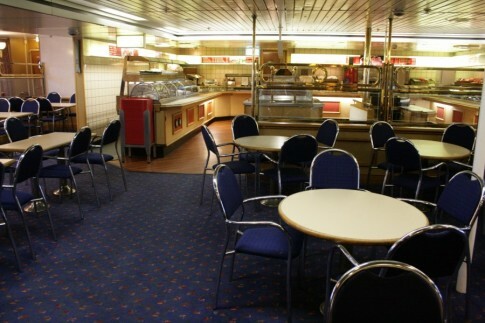 The functional Second Class cafeteria. The vehicle deck, with the retractable mezzanine deck seen stowed to the side. The Antrim Princess served at Stranraer until 1985 when she was displaced by the St David and transferred, on charter, to the Isle of Man Steam Packet, later being renamed Tynwald. 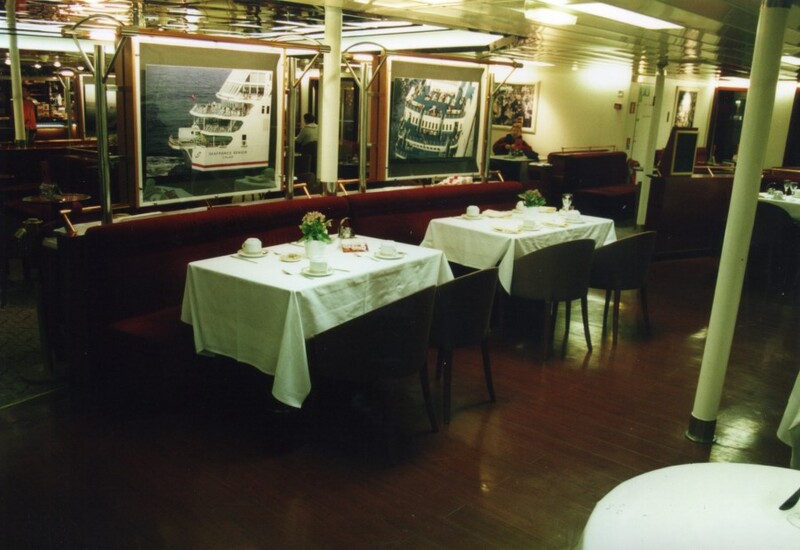 Then, in 1990, the ship was sold to Linee Lauro for Italian service as the Lauro Express. 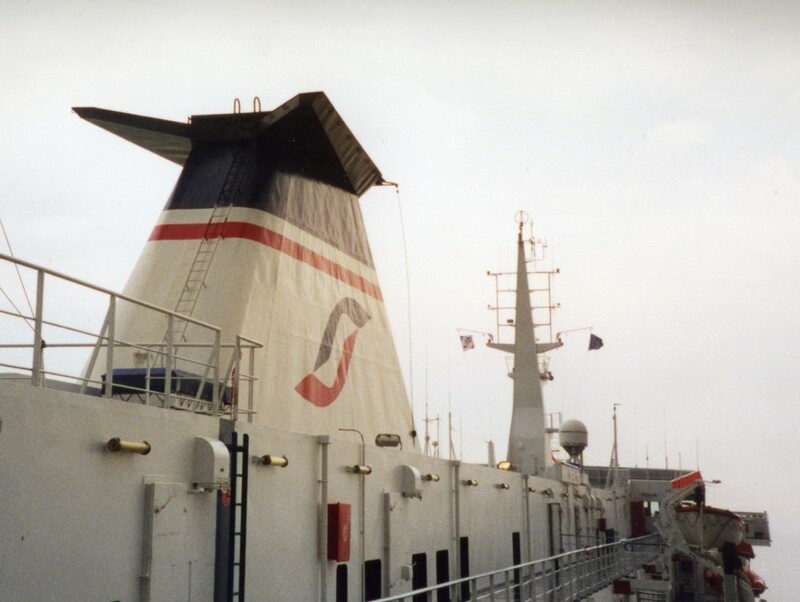 Later serving on services to North Africa, the confusing break up of Lauro’s ferry operations saw the ship pass to the related Medmar in 2003. 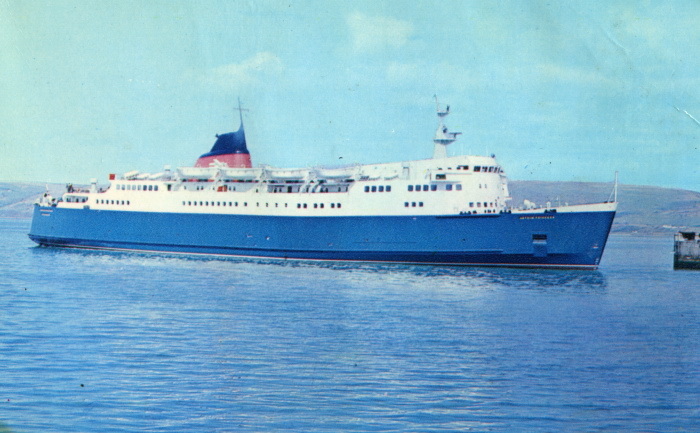 Subsequently renamed Giuseppe D’Abundo, the ship passed for scrap in 2007. 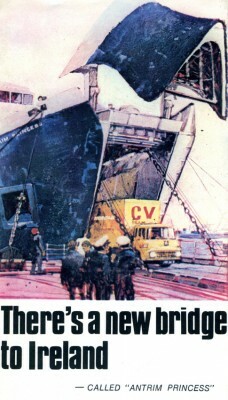 An early visualisation of the St George. As a postscript, whilst discussing the Antrim Princess in their book Designing Ships for Sealink, naval architects Don Ripley and Tony Rogan noted that, “the onset of modern diesel machinery brought about a necessary change in funnel design and after much internal discussion… a new shape was evolved and proved in wind tunnel tests which were carried out at Swan Hunter’s for the [new Harwich-Hook of Holland car ferry] St George but used to devise the geometry also of the Antrim Princess’ funnel.” This connection with the St George is an interesting point, as the latter ship throughout her planning stage was shown with a combined funnel/mast, similar to the Antrim Princess but without the upper part of the exhaust stack which gave it the distinctive ‘fireman’s helmet’ look. 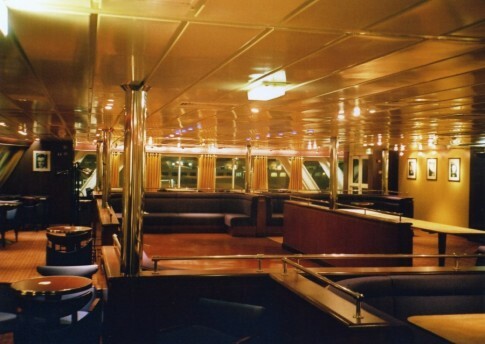 The mast section was ultimately dispensed with entirely on the ‘George’, and all subsequent ships with this signature look followed the Harwich ship’s refined version in one way or another, save for the ‘Antrim’s half sister, the Ailsa Princess. 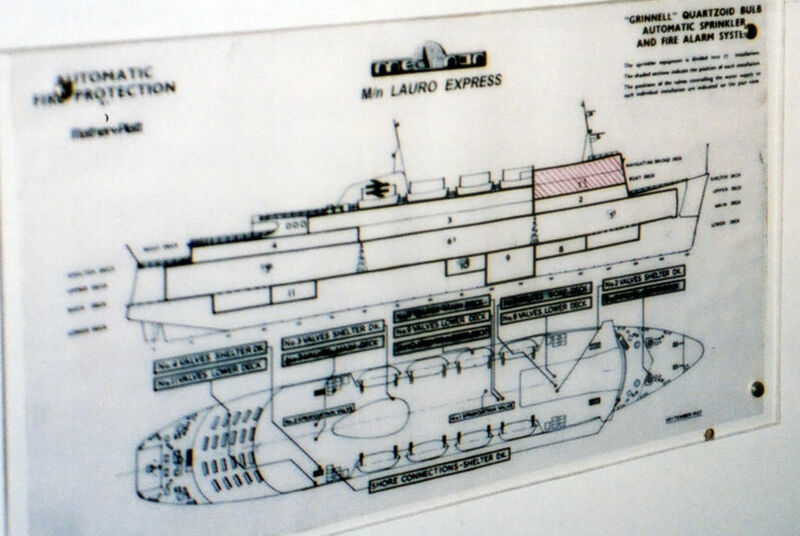 Interestingly, as the Lauro Express, the ex-‘Antrim’ featured modified original safety plans with a funnel design not dissimilar to that originally proposed for the St George suggesting that the final design as used was a late adjustment. Lauro Express plan - with BR funnel. 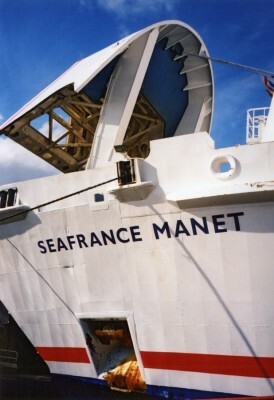 The Seafrance Manet in Belfast before being renamed. 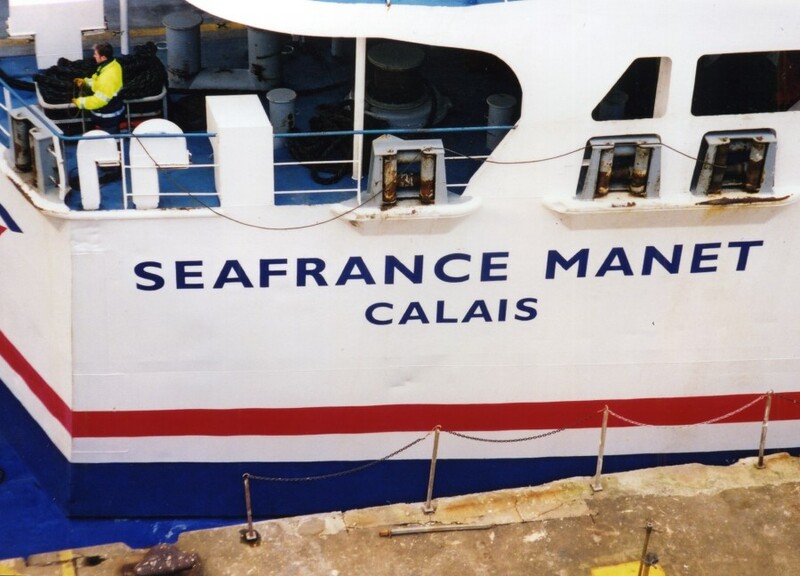 The Seafrance Manet at Calais, September 2002. Less than twelve months ago the newly refurbished Stena Caledonia re-entered service on Stena Line’s Stranraer-Belfast service, operating in tandem with the HSS Stena Voyager. This appeared to be part of a move to re-establish the conventional ferry operation at the expense of the costly HSS, but the acquisition of the 1984-built Seafrance Manet in July to become the route’s second conventional ship was still slightly surprising. 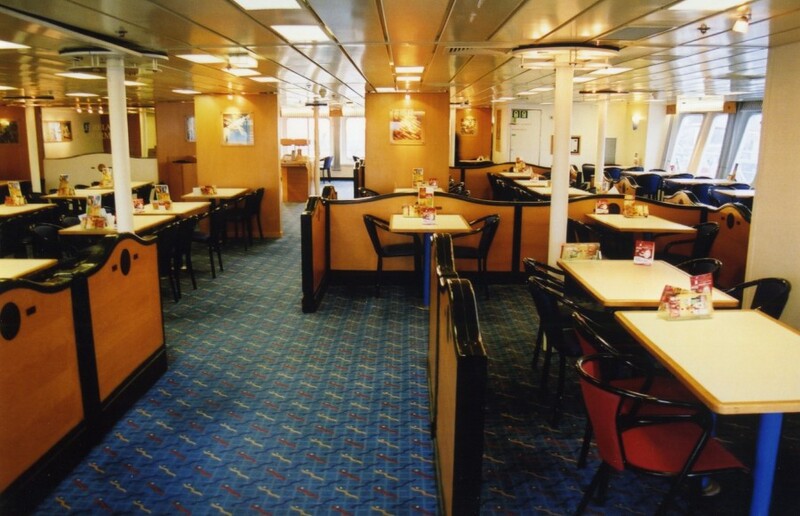 Since the sale of the Stena Galloway in 2002, the ‘Caledonia’ had soldiered on alone in support of the ‘Voyager’ which dominated passenger traffic. 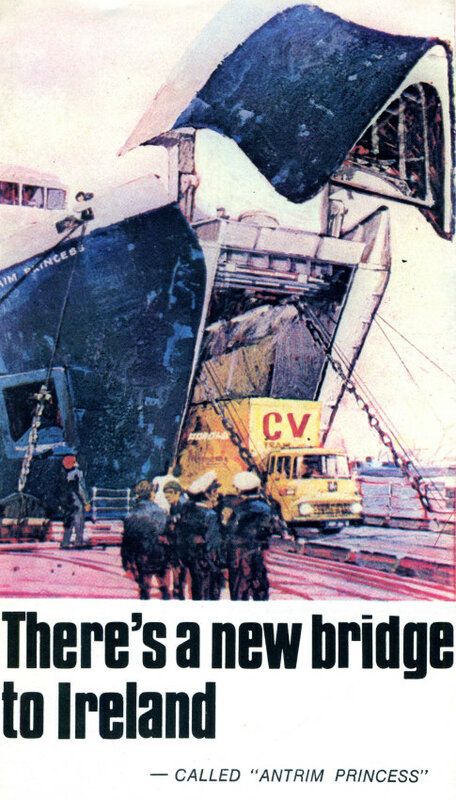 Whilst freight could and is carried to a degree on the fast craft, before her refit this seemed to be the main role of the former St David. 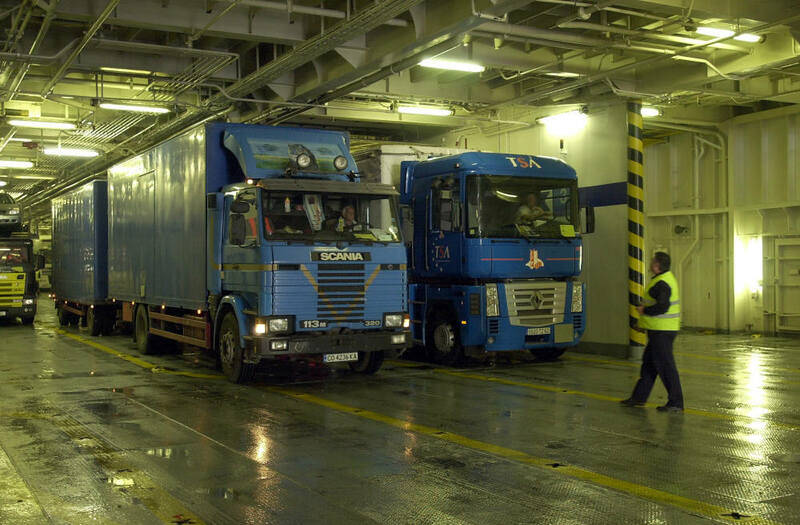 That said, P&O up the coast at Cairnryan and Larne however had achieved a near two-to-one dominance in this market which would have been unthinkable twenty years ago. The Seafrance Manet was duly repainted in full Stena colours in Dunkerque, sailed to Belfast and formally renamed Stena Navigator; a comprehensive internal refit followed. 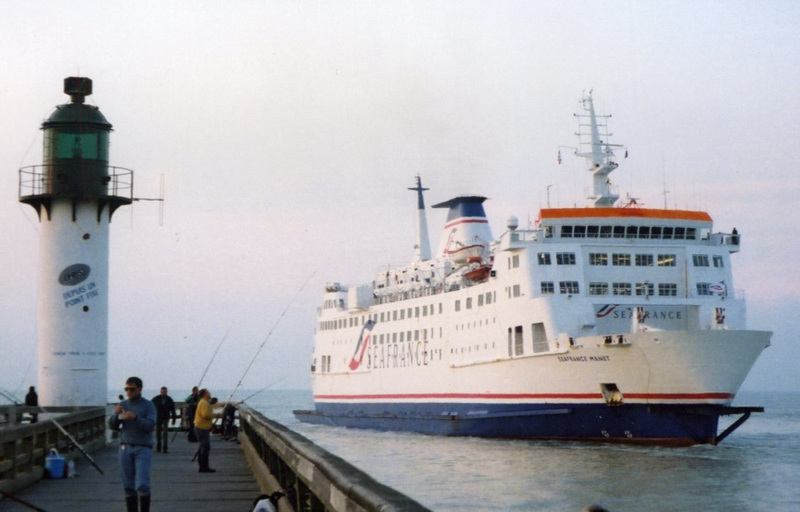 This is not however the ship’s first time operating for Stena – completed for SNCF-Sealink’s Dover Straits operations in 1984 as the Champs Ã‰lysÃ©es she was transferred to the Dieppe-Newhaven route in 1990 and, when SNCF’s successors SNAT finally ran out of patience and closed the operation in 1992, the ship passed under charter to Sealink Stena Line under whose guidance the Dieppe link saw a brief resurgence. As the Stena Parisien, latterly in full Stena Line livery, the ship stayed at Dieppe until the end of 1996 when she was returned to her owners, by now Seafrance. She received a complete refit, acquired the name Seafrance Manet and saw a further eleven years service, latterly in a freight only mode, before finally retiring from Seafrance’s active fleet in April 2008. 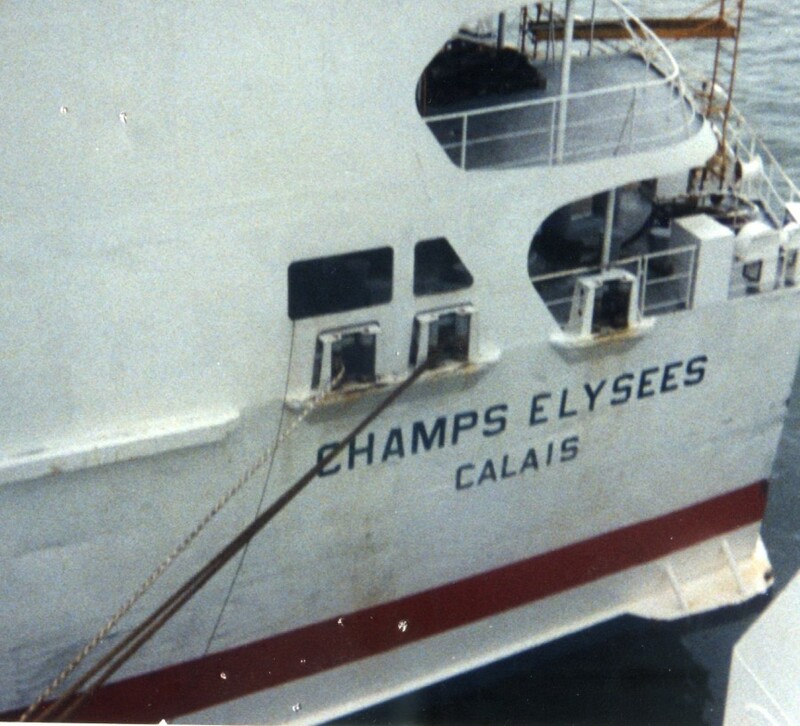 Thereafter she was laid up at Calais and then Dunkerque. The CÃ´te d'Azur (left) and the Champs Ã‰lysÃ©es in Dover harbour in the mid-1980s. Stena’s interest in the ship is doubtless due to her size – the tight requirements of Stranraer limit the vessels which can berth there and, with the port’s future uncertain, ‘Stranraer-max’ newbuilds are out of the question. 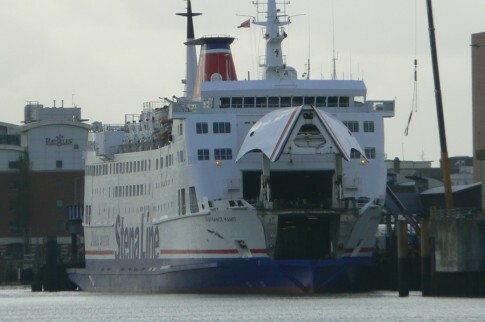 It does not therefore seem likely that this will be a truly long-term purchase, but the ship is still slightly more modern and more capacious from both a passenger and a freight perspective than the Stena Caledonia so she may yet outlast her Belfast-built partner. 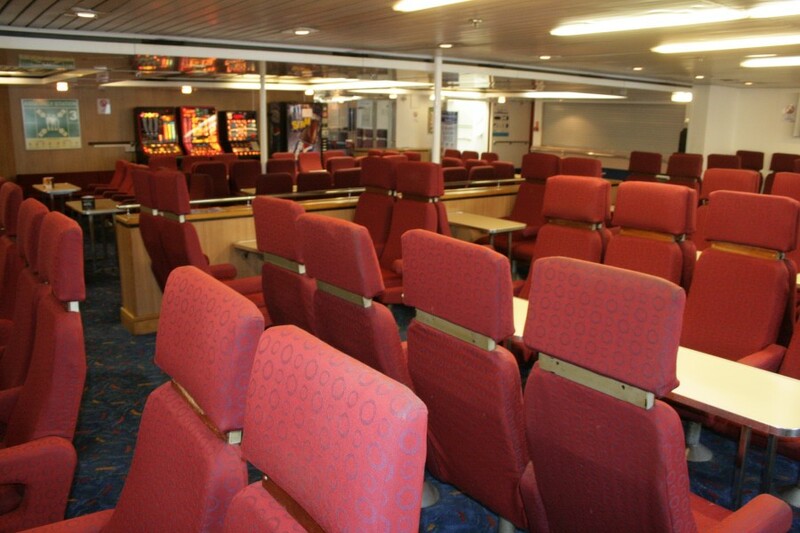 Scott Mackey was on board the ‘Navigator’ during her maiden crossing from Belfast to Stranraer on 12 November and has sent a selection of on board photographs. Paired with equivalent images from the ship during her Seafrance Manet days, it is clear that the refurbishment has been comprehensive – although the change is perhaps not as overwhelming as was the case on the Stena Caledonia, it is still perhaps the largest interior upgrade the ship has had in her 25 year career, erasing almost all trace of the three previous thorough refits by SNCF (1990), Stena (1992) and Seafrance (1996). 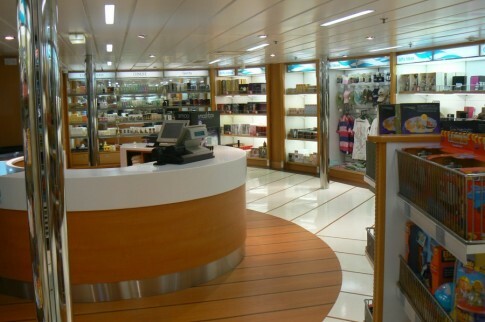 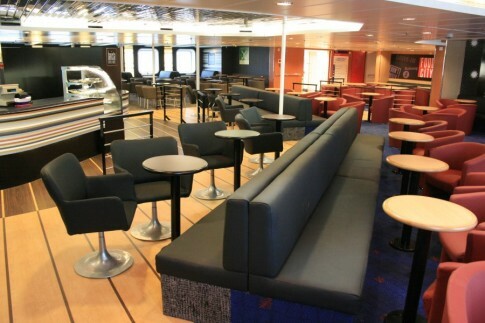 The interior designers for the Stena Navigator refurbishment were, once again, Figura and the project was managed by MJM Marine. The Stena Navigator in full Stena livery, late October 2009. 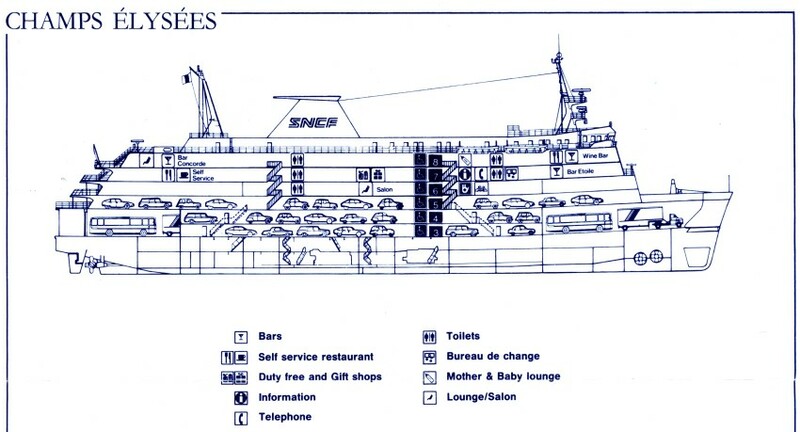 Click above for Champs Ã‰lysÃ©es (1986) and Seafrance Manet (2002) deckplans and below for a Stena Navigator plan. 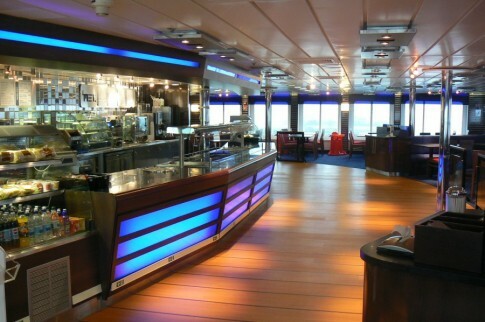 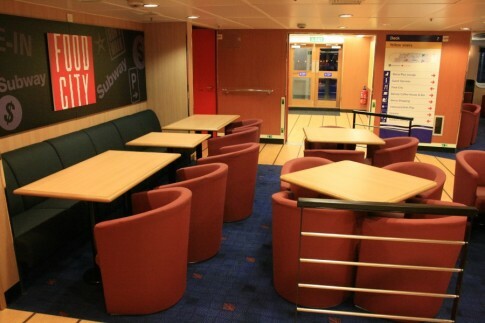 The same area on the Stena Navigator. 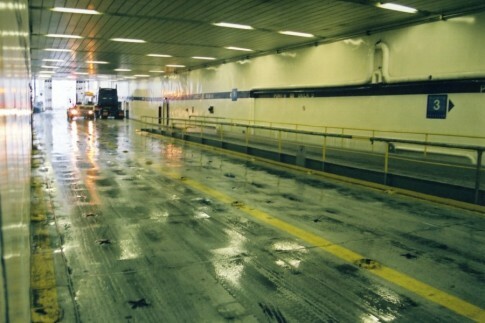 In this image the ramp connecting the two vehicle decks is visible - this was installed prior to the ship's transfer to the Dieppe service in 1990. Looking aft on the upper vehicle deck. 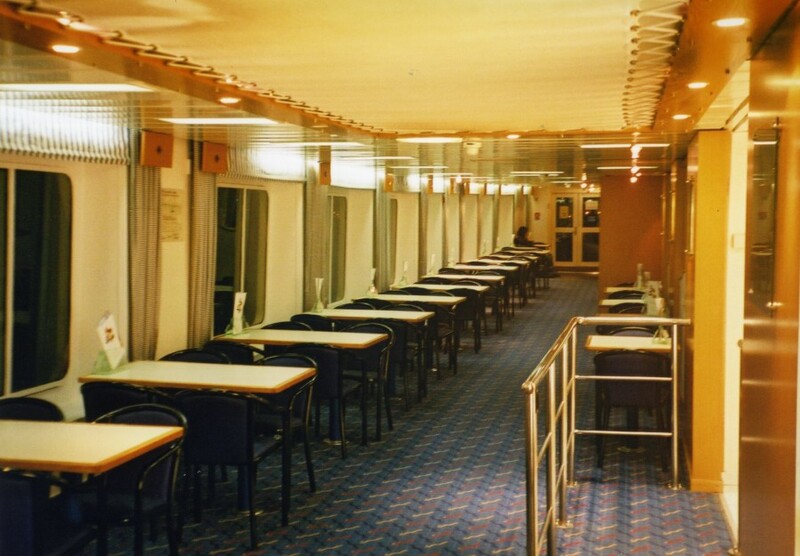 As with her half sister (the former CÃ´te d'Azur, now Seafrance Renoir), the Champs-Ã‰lysÃ©es had side lounges on either side at mezzanine level on the upper vehicle deck. 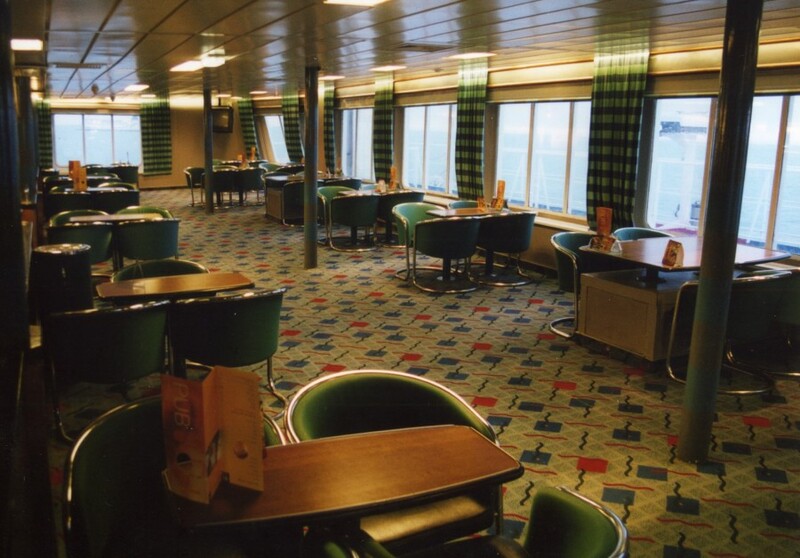 This was filled with reclining seats for use on the Dieppe service but was closed off under Seafrance. 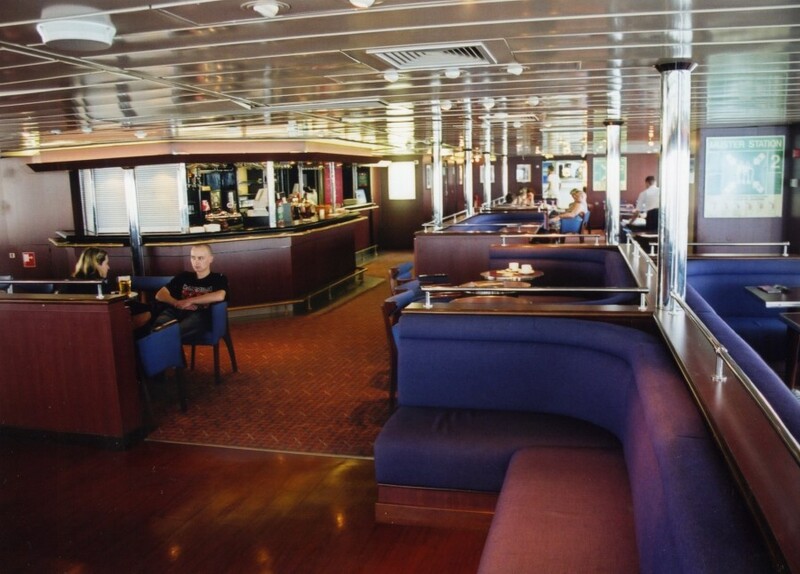 The starboard lounge is seen here (through a locked door!) 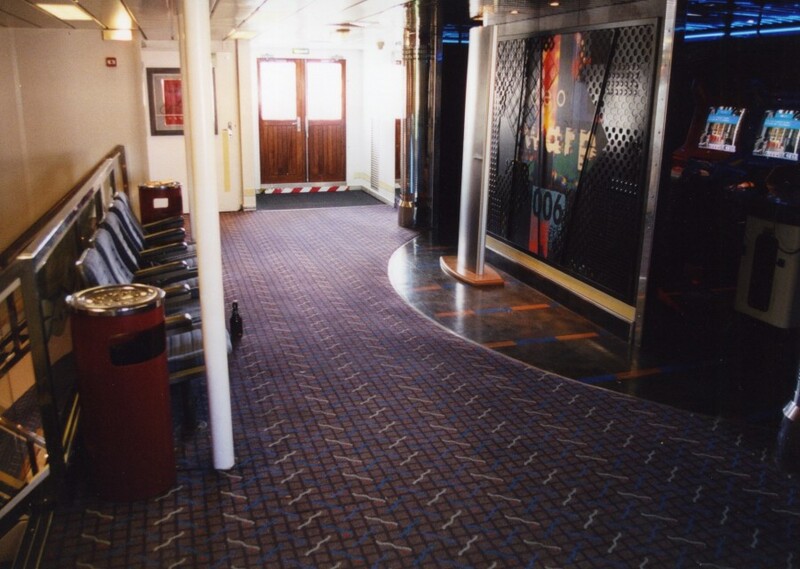 on the 'Manet' in May 2000. 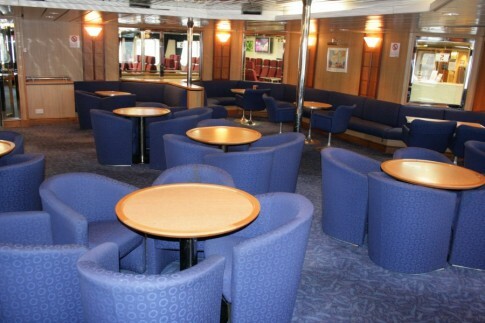 On the 'Navigator' this area, pictured, is now a truckers' lounge. 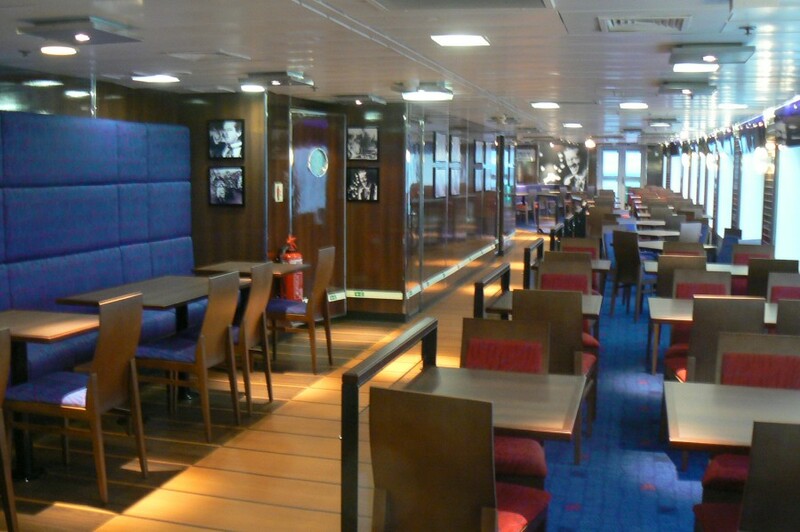 A similar space on the port side, aft, has become the truckers' restaurant. 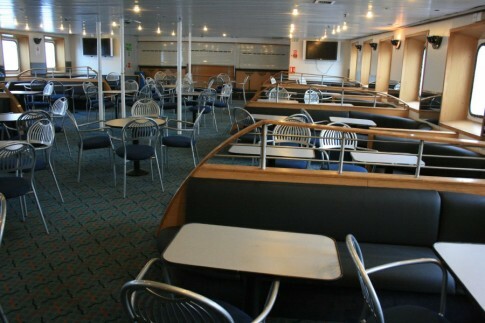 Moving upstairs, on Deck 7 aft is the new 'Met Restaurant'. 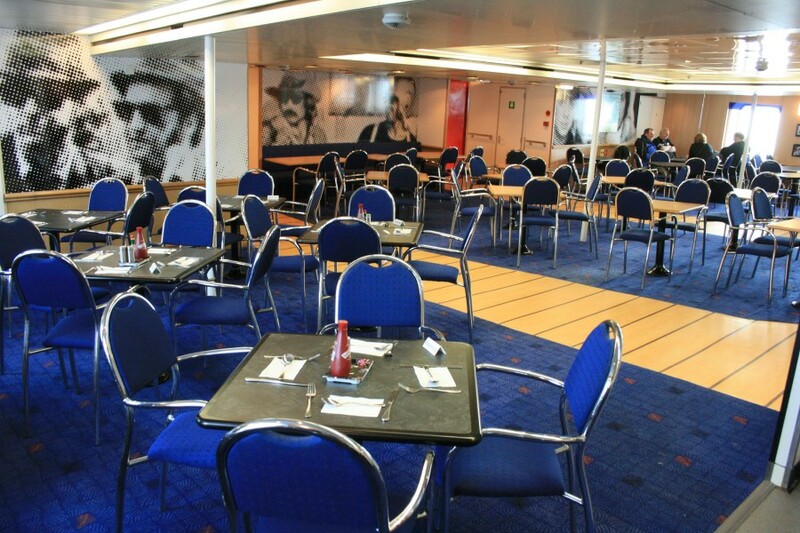 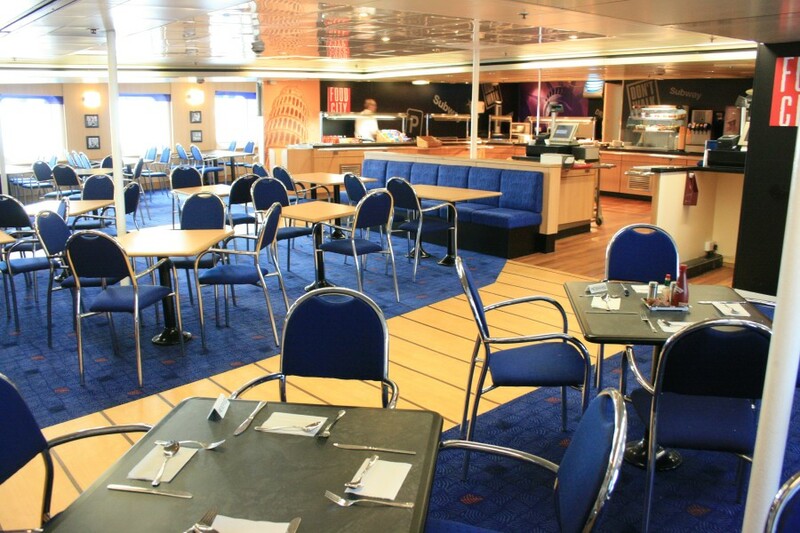 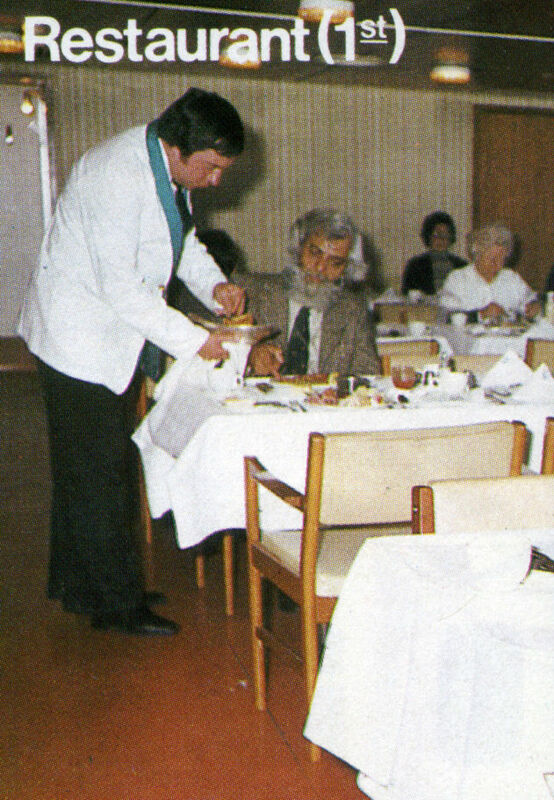 Although latterly and originally a self service, when the ship was with Stena the first time around, this area was the Monet Restaurant, with the self service on Deck 8. 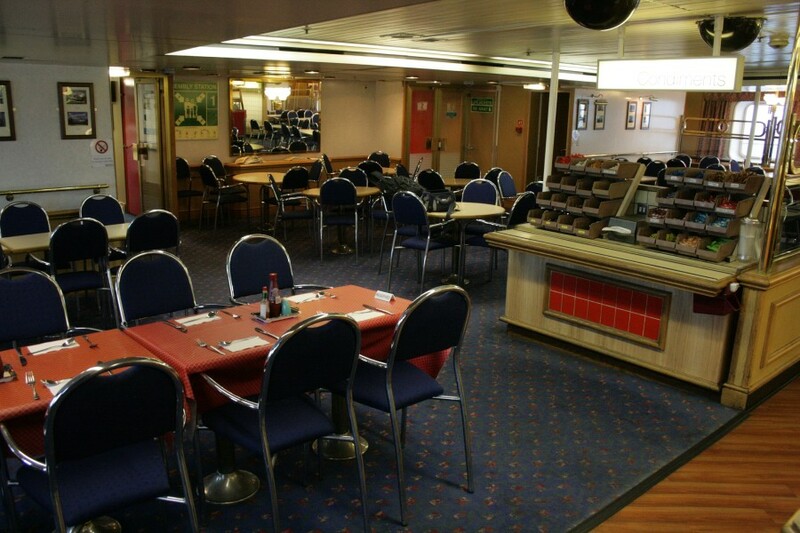 Looking across to starboard in the aft section of the self service ('Le Relais') - Seafrance Manet, December 2005. 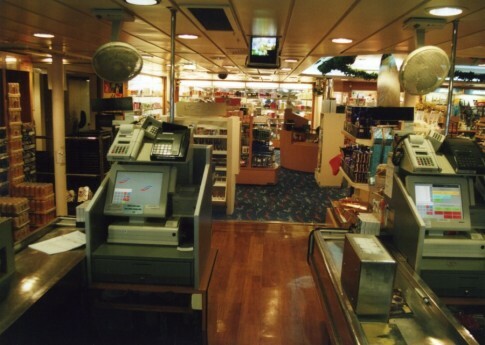 Looking aft on the starboard side (January 2003). Looking aft on the starboard side (November 2009). Moving forward this view is of the aft lobby, looking across to port, on the 'Manet' in August 2004. 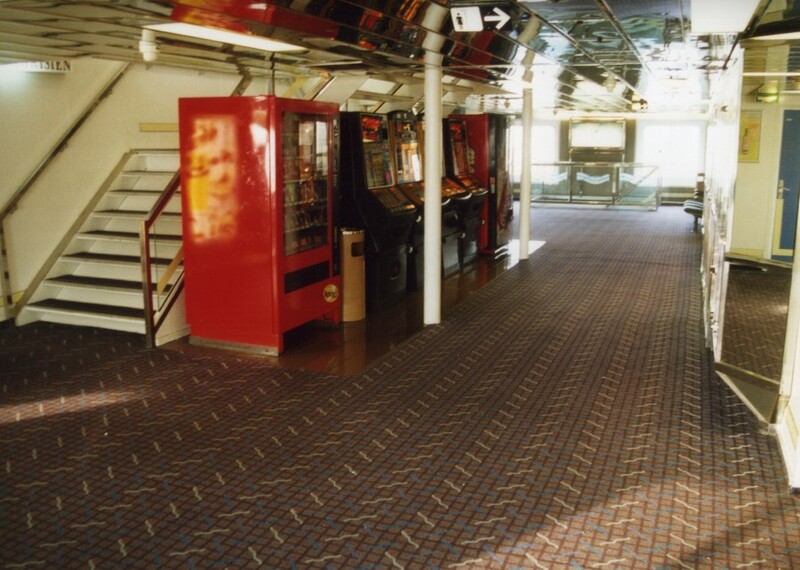 The same area today, this time seen from the port side with the entrance to the new children's play area visible. 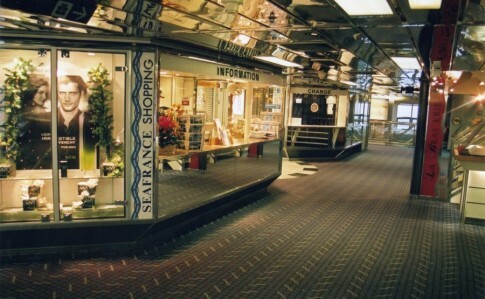 Running up the centre line of the ship on Deck 7 for the ship's entire English Channel career was the shopping centre (seen from astern in December 2004). 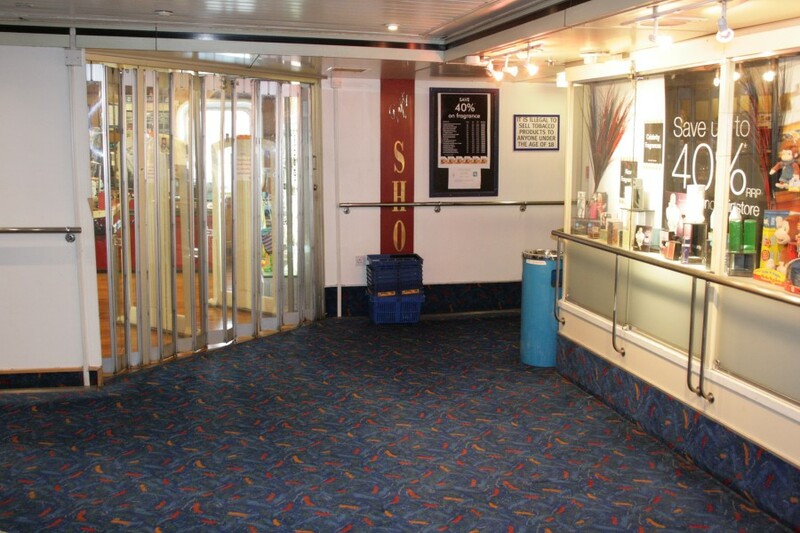 This has now been split into four, with a new children's play area (aft), a smaller shop (forward) and two cinemas in between. This is a view of the former, taken from the same angle as the shop picture above. 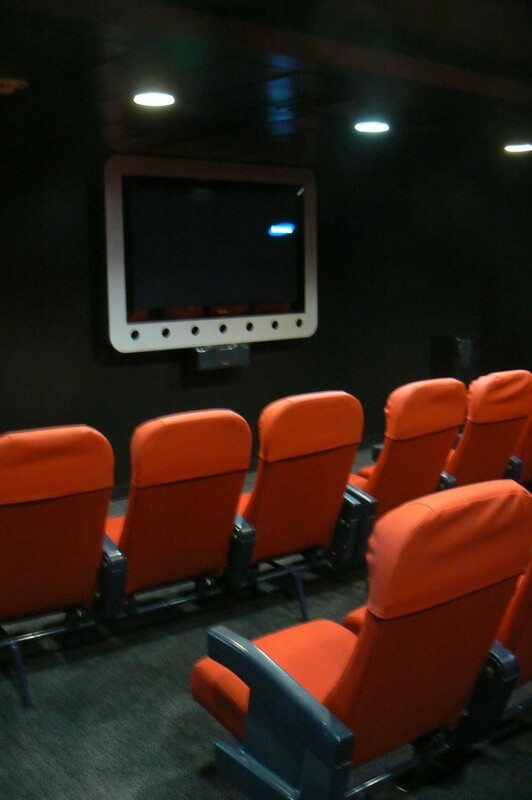 One of the two new cinemas. The remaining shop area on the 'Navigator'. On either side of the shop, amidships, were a pair of almost classic-style seating lounges. The starboard-side of the pair is seen here in April 2004. 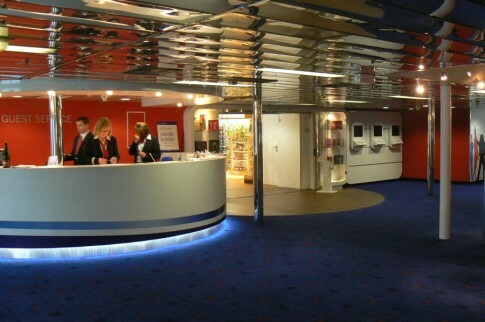 The forward lobby on the Seafrance Manet, looking across to port, with reception desk (nearest), bureau de change (far side) and entrance to the shop in between. 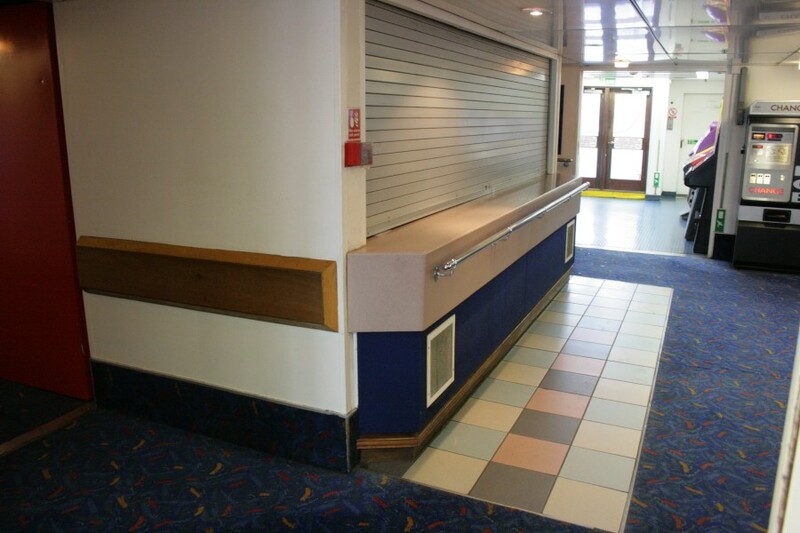 The same area in November 2009, with a new 'Guest Services' counter. 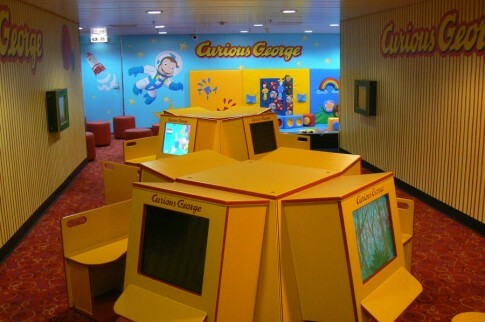 An internet station has replaced the bureau de change. Forward on the ship, as built, was the Bar Ã‰toile. It's function as the primary bar on board was consistent through subsequent guises as Bar Saint-Michel (Sealink/Stena) and 'Le Pub' (Seafrance - photographed August 2004). 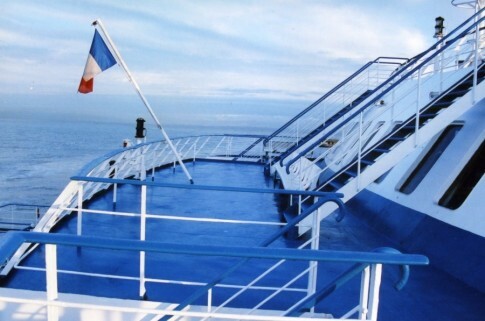 Another view of 'Le Pub', December 2005. 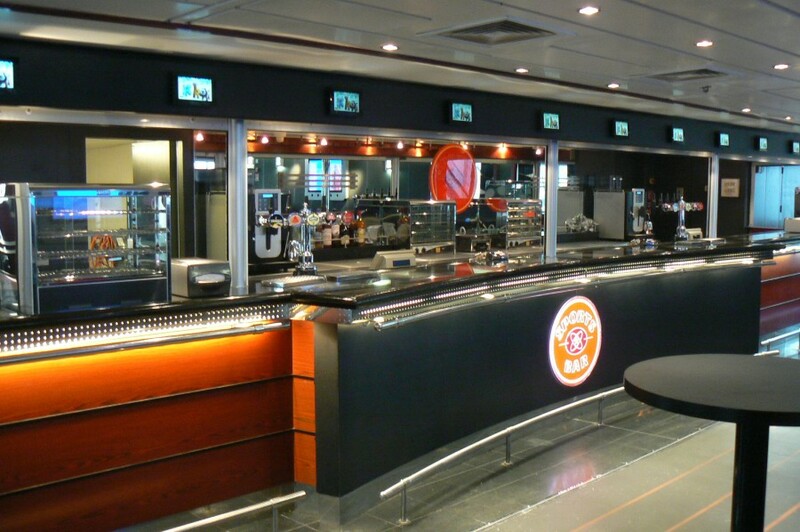 On the Stena Navigator this area has become the Barista Coffee House. 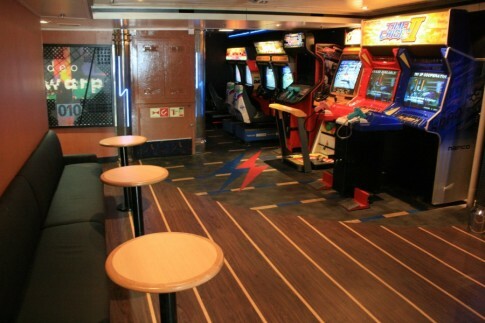 The forward part of 'Le Pub'. 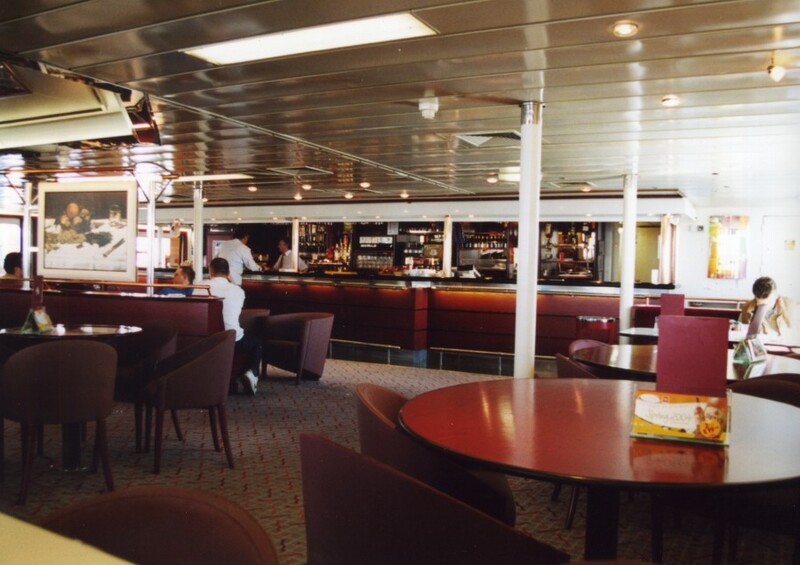 Looking aft towards the bar counter, March 2001. 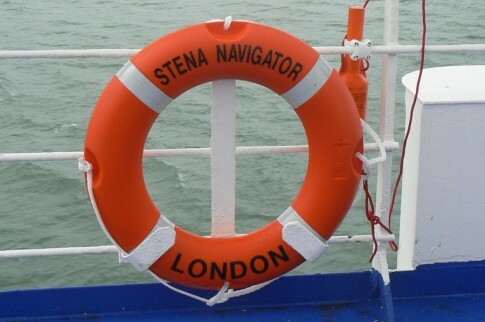 A similar view on the Stena Navigator. The forward stairwell, seen from Deck 8 in December 2002. 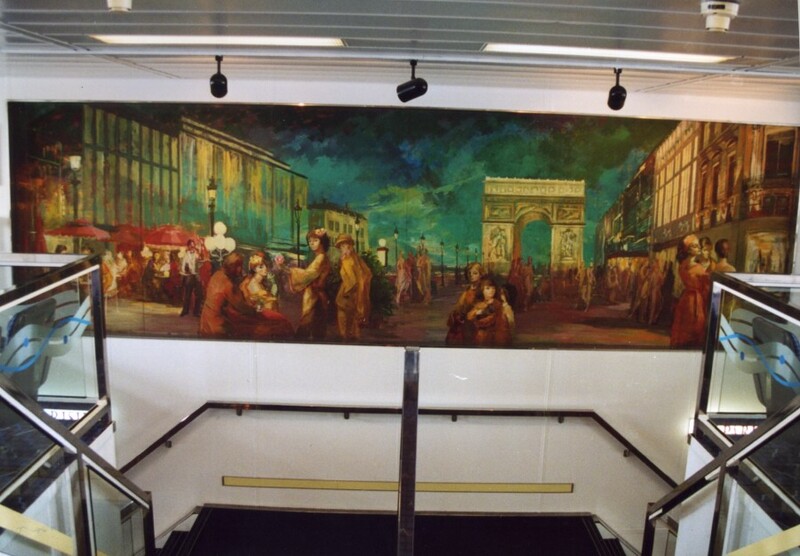 This originally featured one of a pair of Parisien scenes by the artist HervÃ© Loilier commissioned for the ship by SNCF but latterly was adorned by this copy of Manet's painting, 'Argenteuil'. 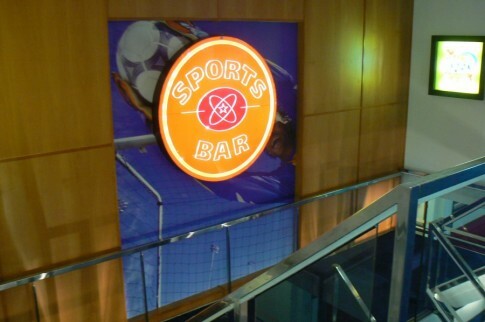 On the Stena Navigator this has been replaced by a sign promoting the Sports Bar (forward on Deck 8). 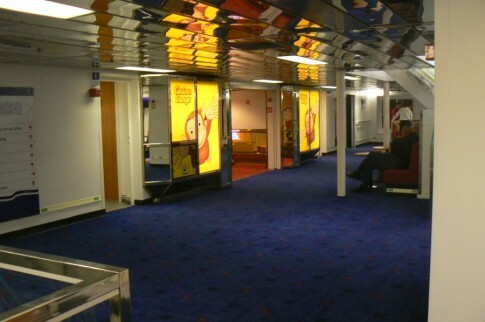 The Deck 8 forward lobby at the head of the stairwell, seen in April 2004. 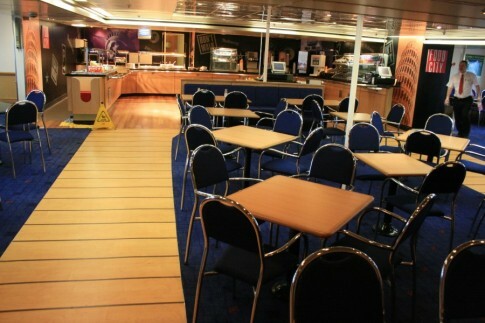 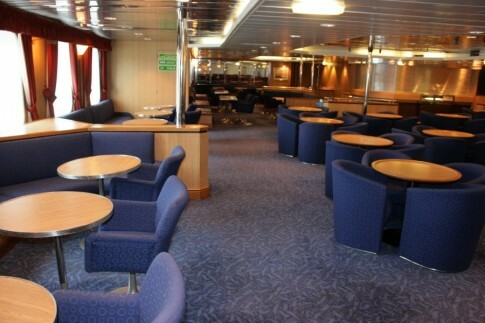 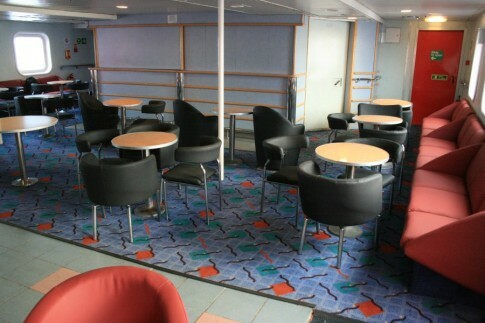 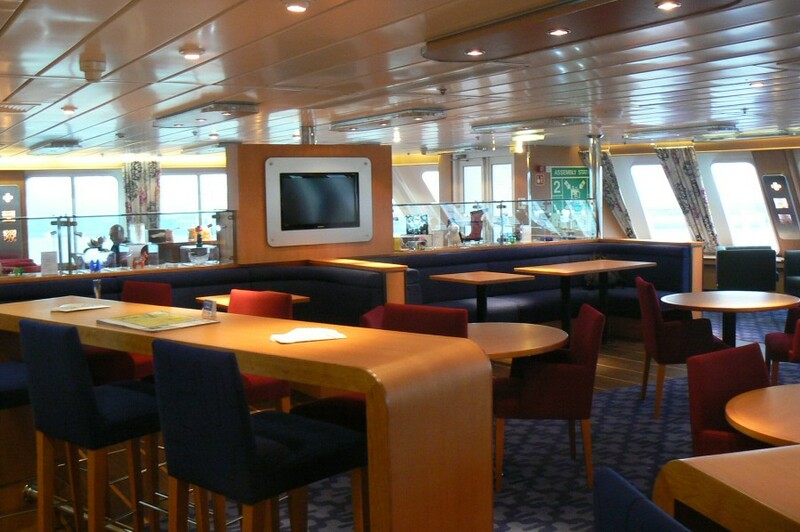 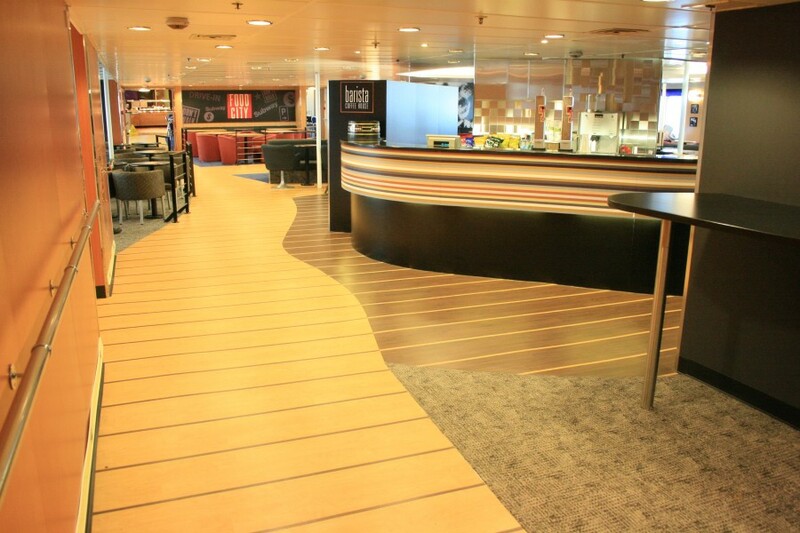 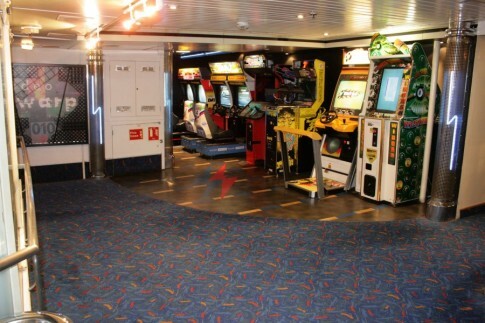 To the right (aft) the video games area retained the former Stena 'Video Warp' branding throughout the Seafrance era. The video games space is now 'Teen Town'. 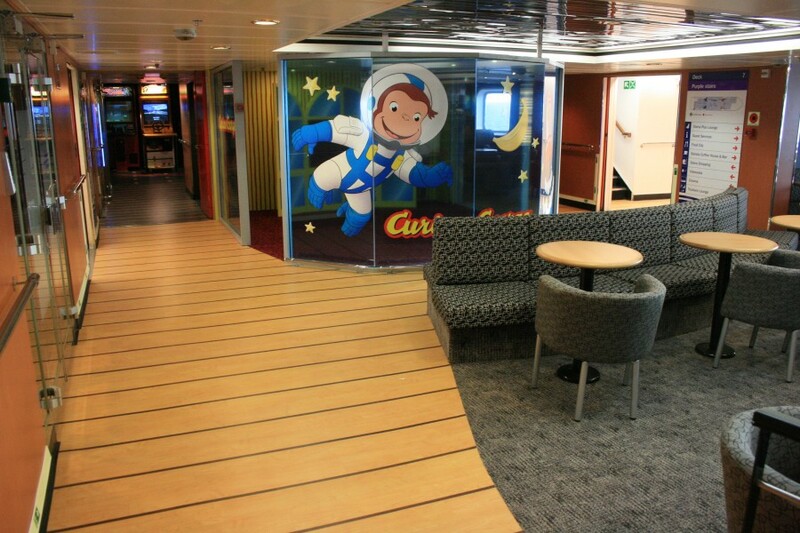 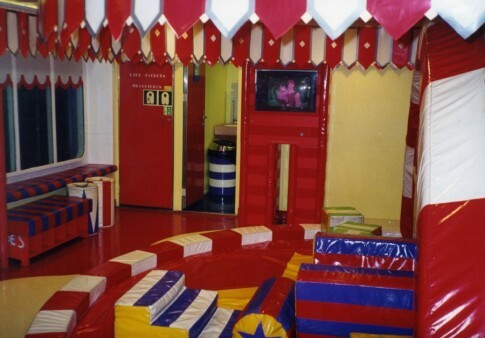 To port off the forward lobby under Seafrance was 'Playzone Le Cirque'. 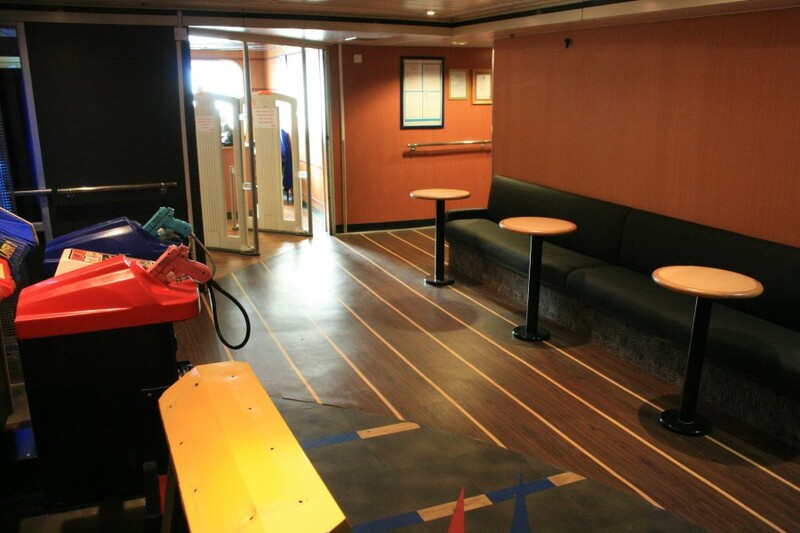 With a new play area downstairs, this has been closed off on the Navigator. 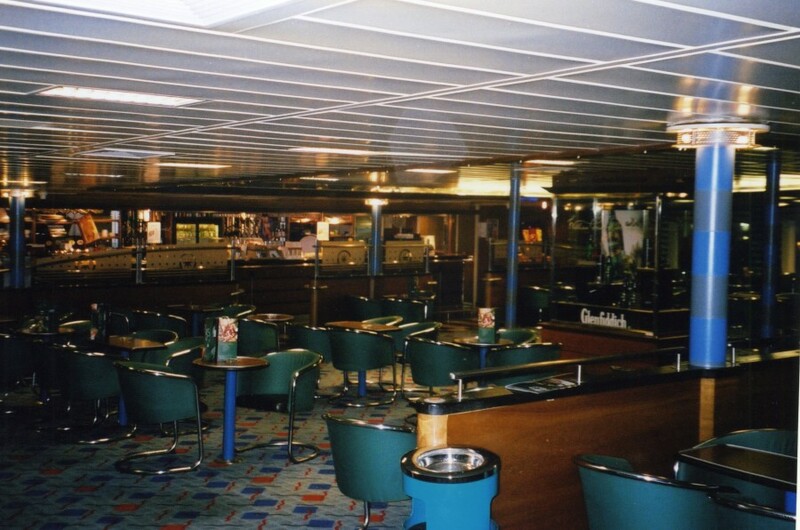 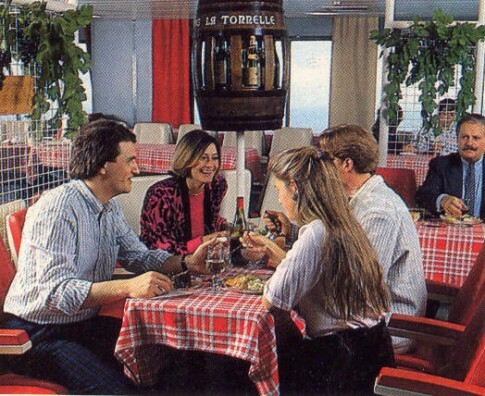 As built the forward saloon on Deck 8 was a 'Buffet Express' but this soon became a wine bar with a slightly clichÃ©d choice of decor (as pictured in the late 1980s - note the oddly out of place fixed seating from the area's original incarnation). 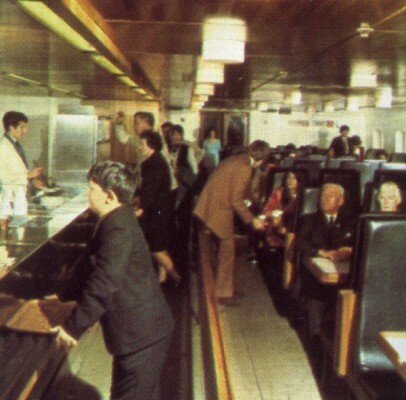 In the Dieppe days this space became the self service Cafe Champs-ElysÃ©es. With Seafrance (as pictured in April 2004), it was La Brasserie Bar with a waiter-service restaurant area at the forward end. 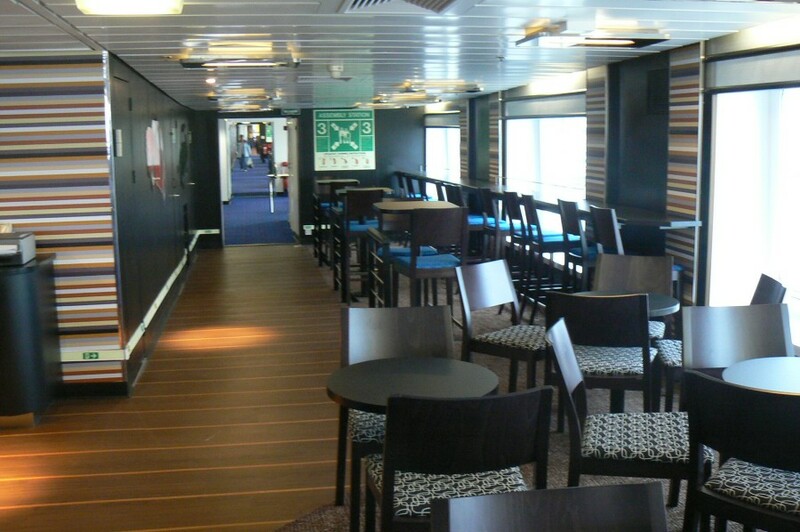 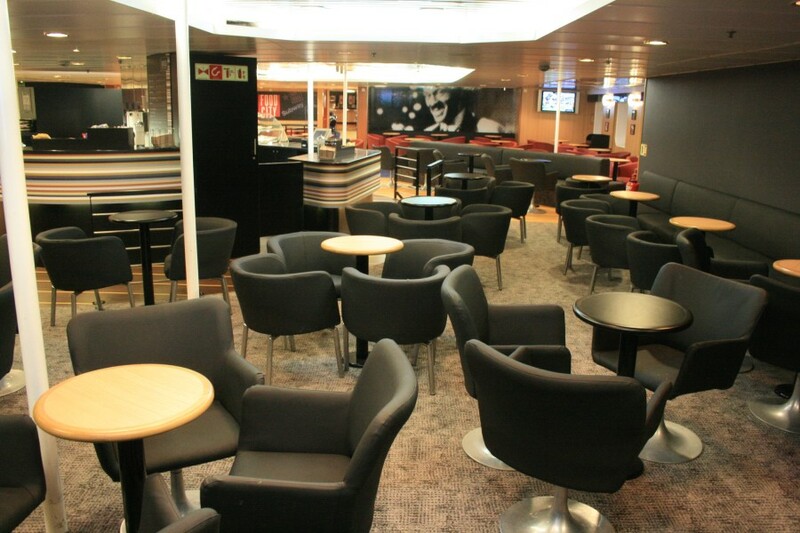 Stena have completely refurbished this area and it is now a Sports Bar. The forward restaurant part of La Brasserie, December 2004. 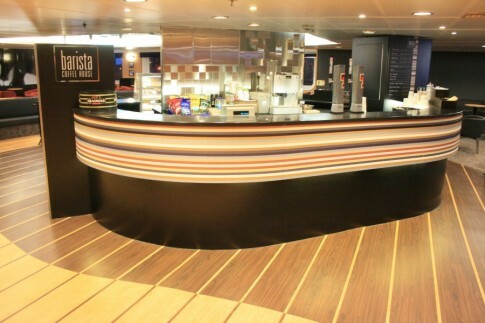 The bar counter in the Sports Bar on the Stena Navigator. 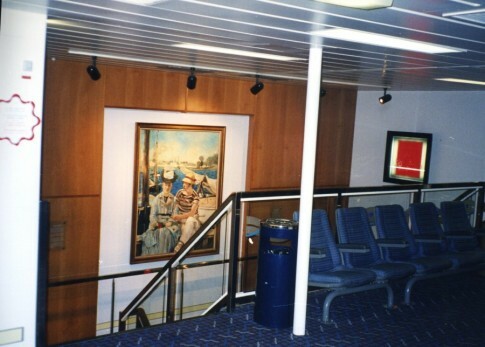 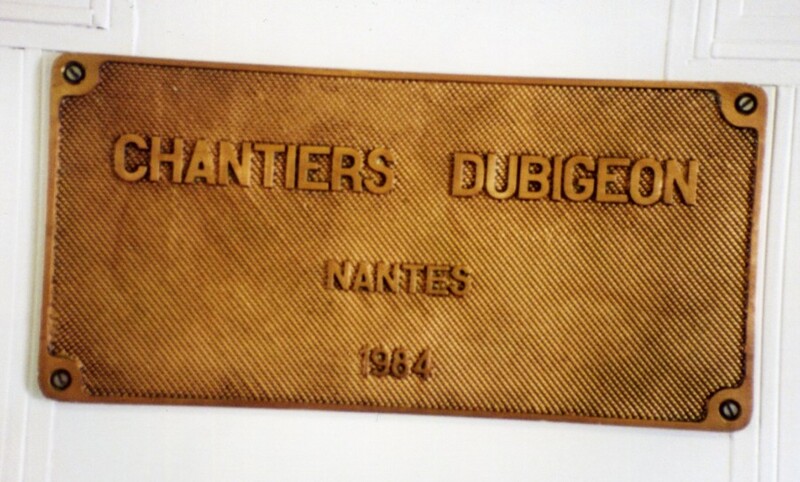 The ship's builders' plate survived in one of the lobby areas into the Seafrance era - it is seen here in May 2000. The aft stairwell on the Champs Ã‰lysÃ©es featured the second of the HervÃ© Loilier paintings, a street scene of the ship's namesake Parisien avenue. 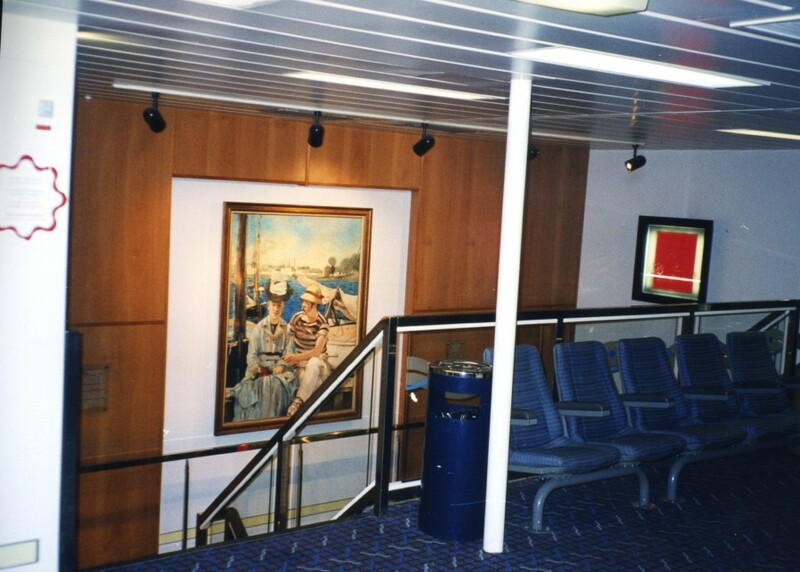 Unlike the matching painting in the forward stairwell, this survived throughout the ship's English Channel service. 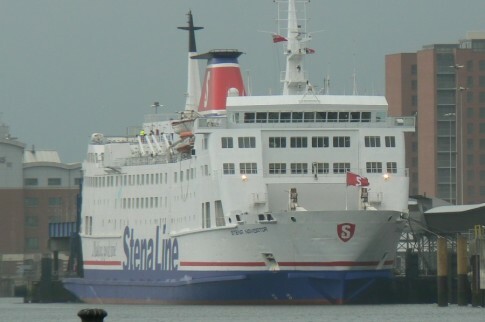 The replacement on the Stena Navigator, outside what is now Stena Plus, is quite a contrast to its predecessor! 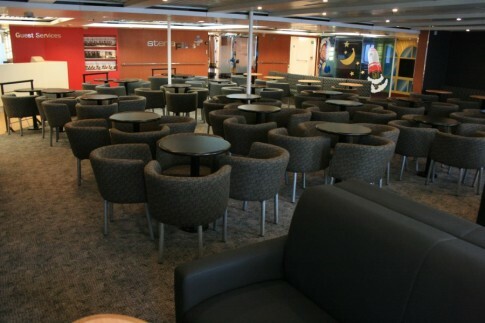 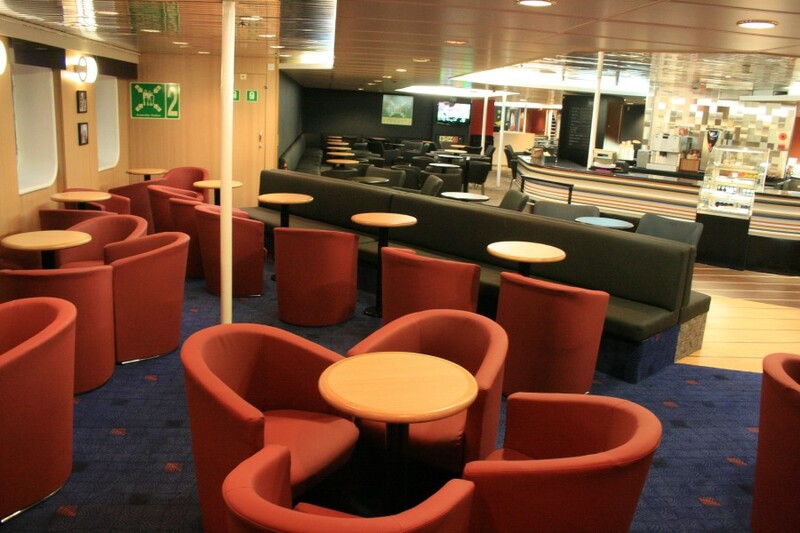 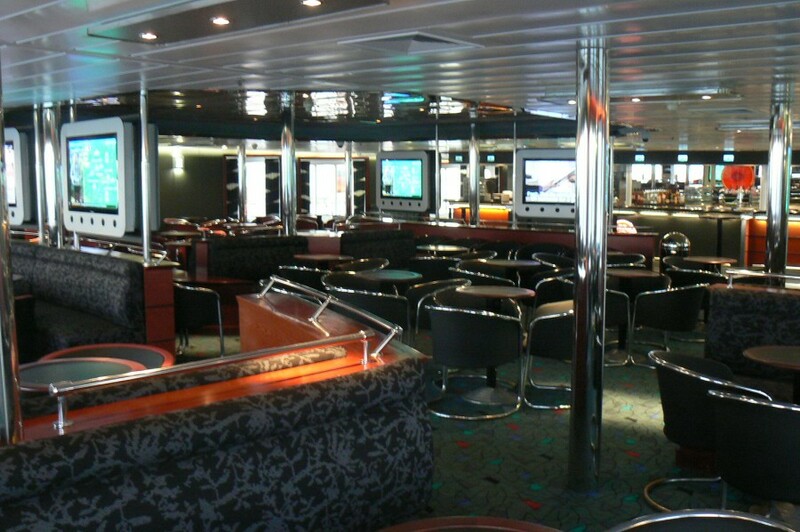 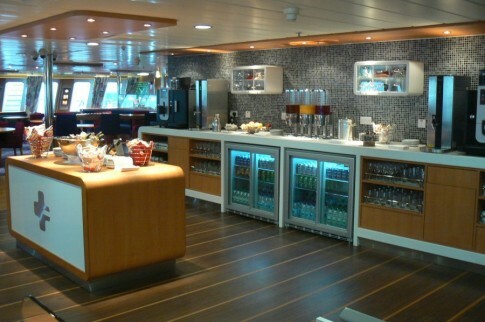 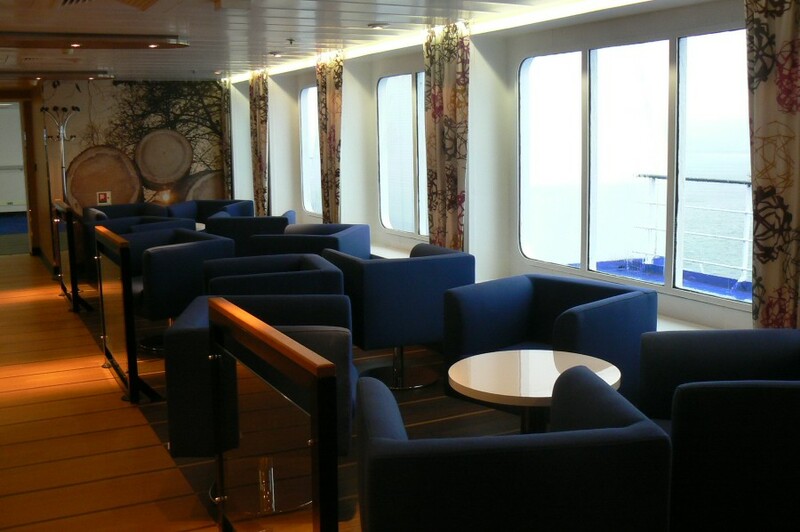 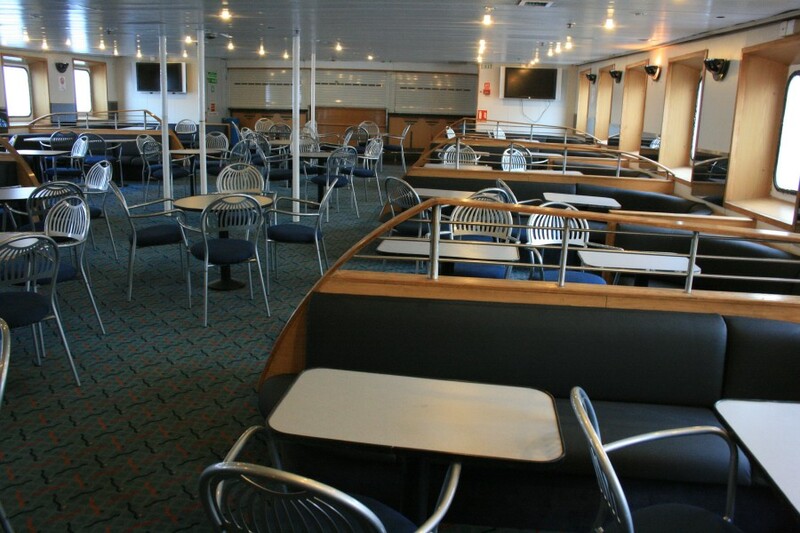 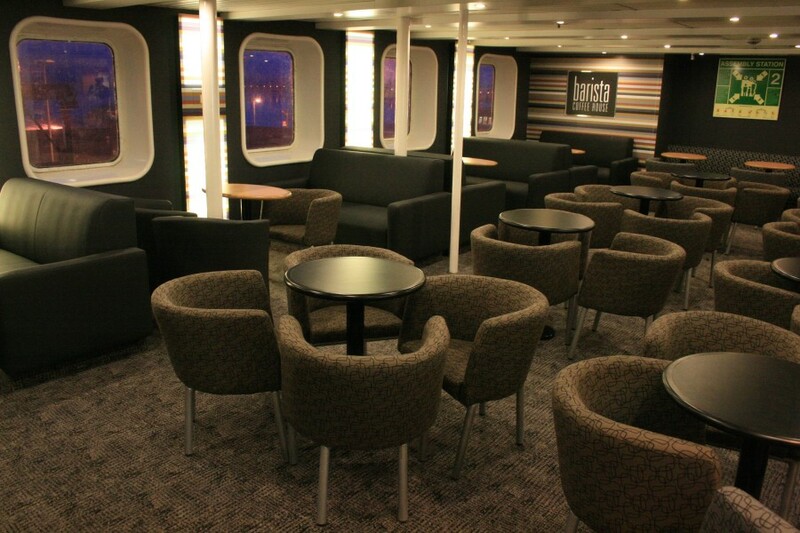 The Deck 8 aft lounge was originally the dark and subdued Bar Concorde. Under Sealink Stena this became the Bar Pigalle and with Seafrance the Parisien Cafe (as pictured, January 2003). 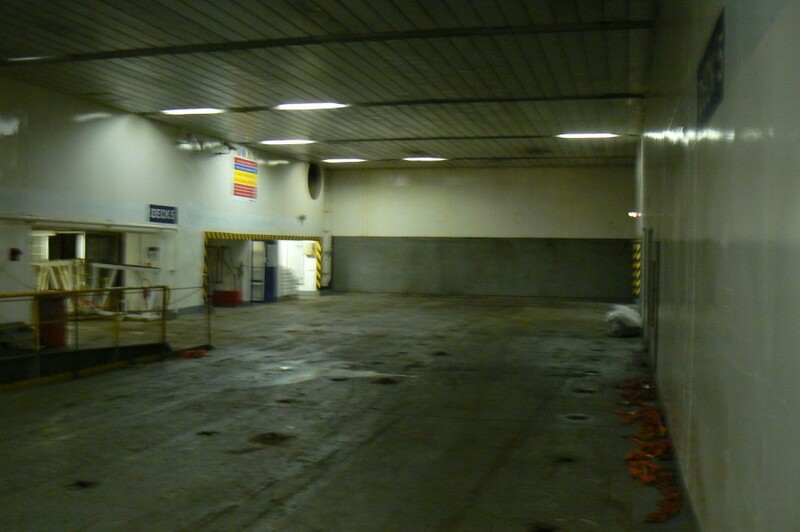 The same area is now Stena Plus. Looking across to port in La Parisien. 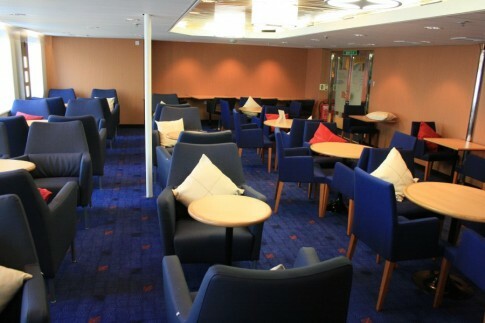 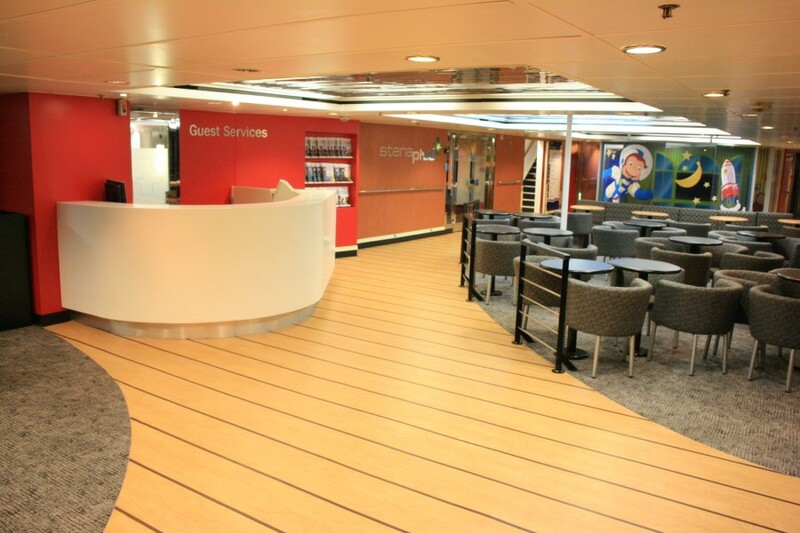 An overall view of the new Stena Plus lounge. 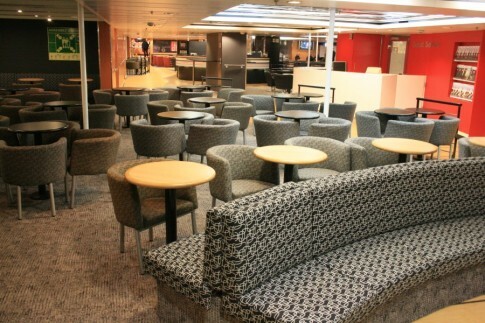 A corner of Stena Plus, November 2009. 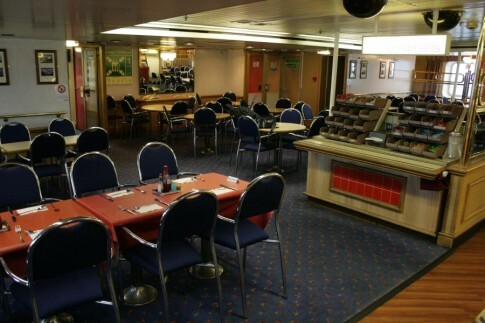 Deck 8 aft, December 2005. 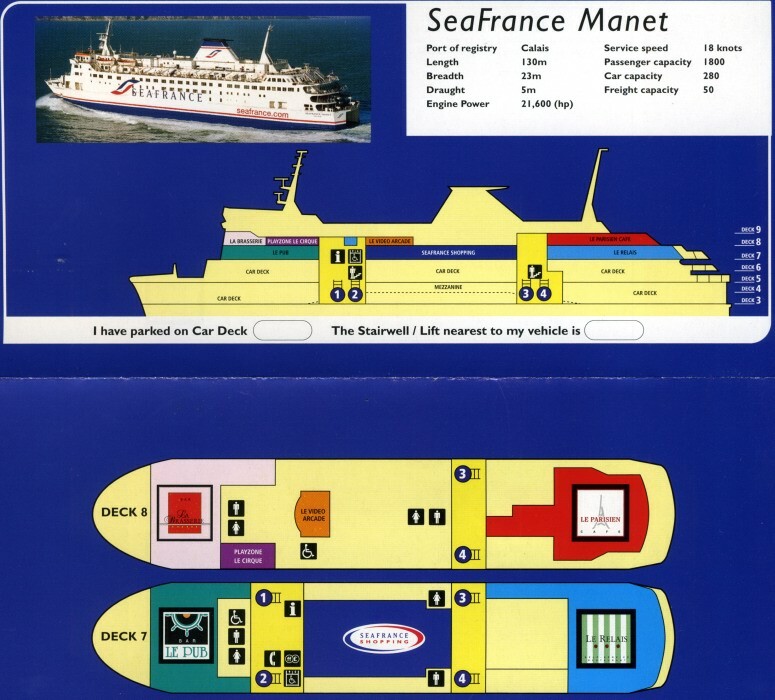 Thanks again to Scott Mackey for the Stena Navigator pictures, and to Richard Seville for some background details on the Stena Parisien’s Dieppe-era layout. In January 2009, Stena Line confirmed they were continuing their recession-busting modernisation programme by investing Â£1.8m in a thorough upgrade of the Stranraer-Belfast route’s single conventional vessel, the Stena Caledonia (ex-St David of 1981). This followed on from a not dissimilar amount spent on the route’s HSS Stena Voyager in 2008. 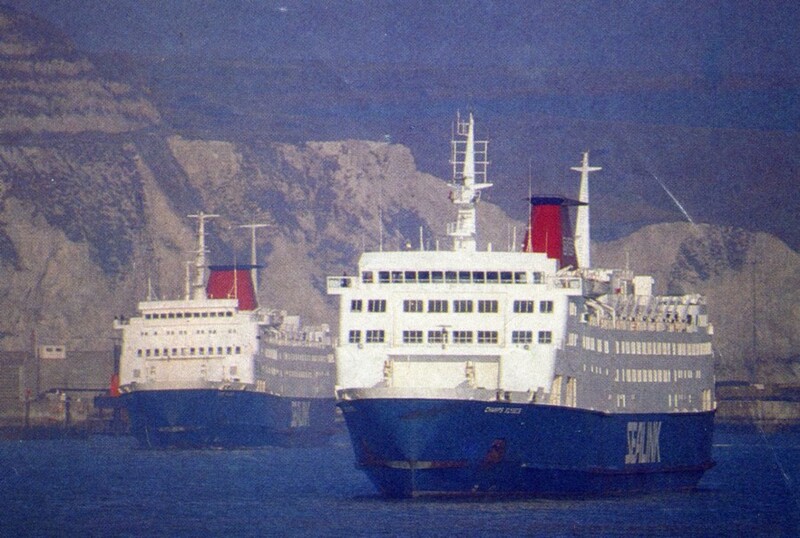 The plan appears to have been to move the ‘Caledonia’ back into primary use for passengers, rather than the reserve/freight/night ship she had tended to become by default with the Voyager taking most passengers. Falling oil prices since the decision to invest was made however seem to have changed things – the refit went ahead, but in the event the HSS has remained in full use and so the Caledonia’s new facilities have, in the brief period since she returned from refit, been largely underused. 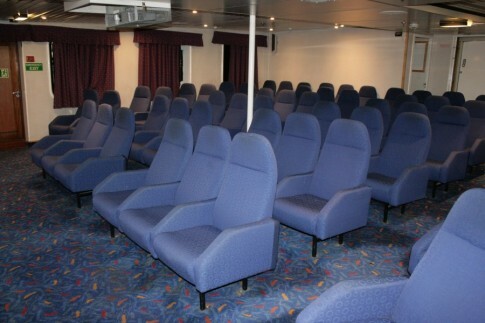 For anyone who has sailed on the ship before, upon boarding it is quite hard to orientate yourself as the entire centre section of the ship has been swept away – of all of the four ‘Saint’ class ships, the main deck of the former St David perhaps most lived down to billing with a predomination of fairly uninspired fixed seating. 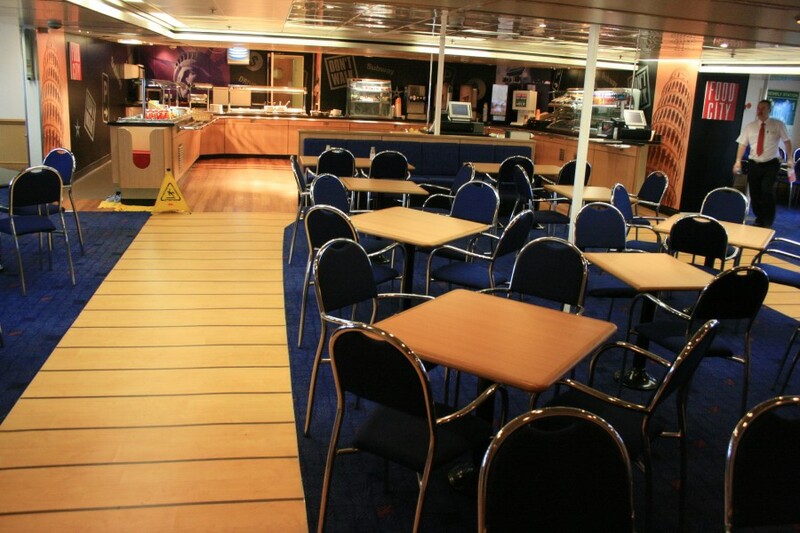 Save for the cinema and shop at the stern (largely unchanged) and the cafeteria forward, this has now all gone, replaced with a very open plan Barista Coffee House with a small Stena Plus lounge to starboard in the area formerly housing part of the Motorists’ Lounge. 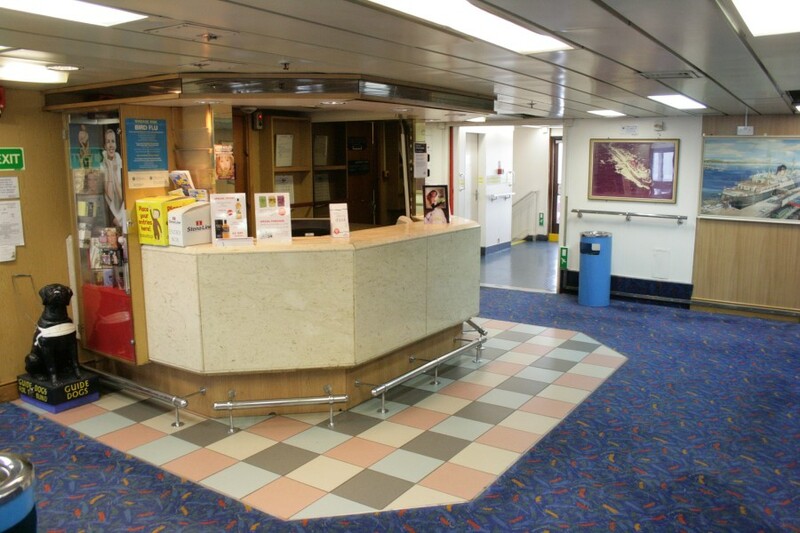 The effect is a little overwhelming but certainly, given the ship is destined to remain on the North Channel for a few more years yet, she was overdue a refurbishment. Stena, and their house interior designers Figura, have been stung by criticism in the trade press recently concerning some of their more recent refurbishments and, as in parts of the refitted Stena Nordica, a determined effort has been made on the ‘Caledonia’ to allow quiet spaces where one can simply sit and read, snooze or work on a laptop. 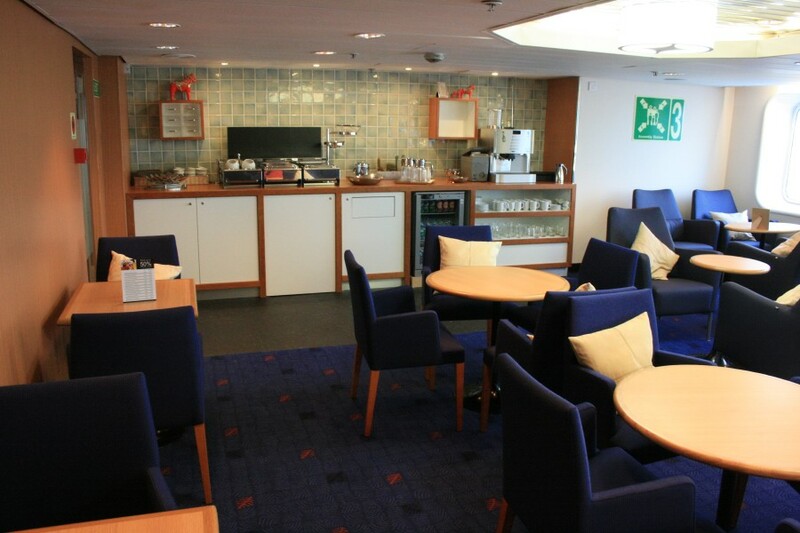 Although the open-plan nature of the Barista Lounge mitigates this to an extent, areas have been notionally designated for families and as a quiet lounge although this may take some policing if it is to be effective on a busy sailing. In summary however, it was great to see the Stena Caledonia revitalised. Even if the ship is going to have only a relatively short future in her present operation, it is clear that Stena don’t intend to let the ship be run down before retirement. The refurbishment is certainly fairly dramatic and doubtless not to everyone’s taste – I’ll let you draw your own conclusions and below are some recent images from on board the ship, with a few pictures of the same spaces interspersed as a reminder of what used to be. Click on the pictures for larger versions. 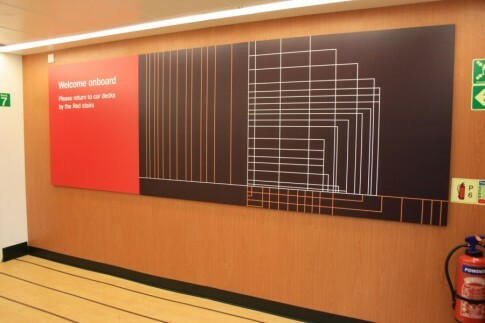 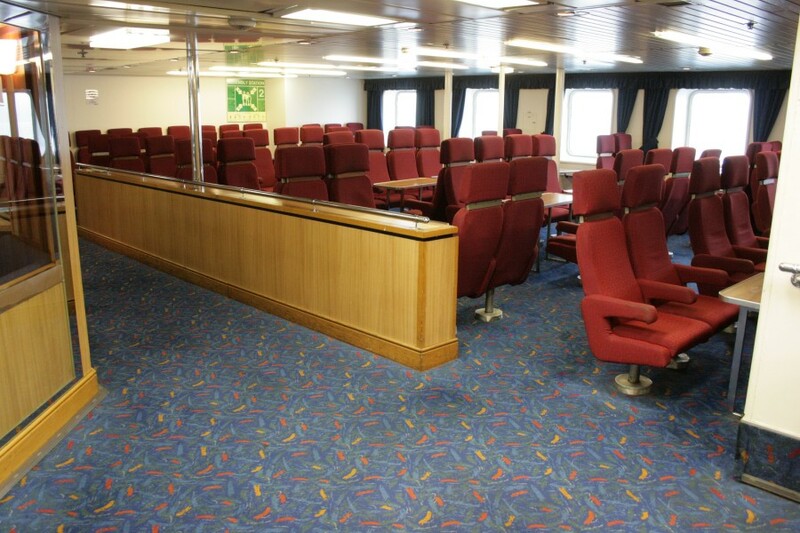 Click here for a main deck plan photograph of the ‘new’ Stena Caledonia. 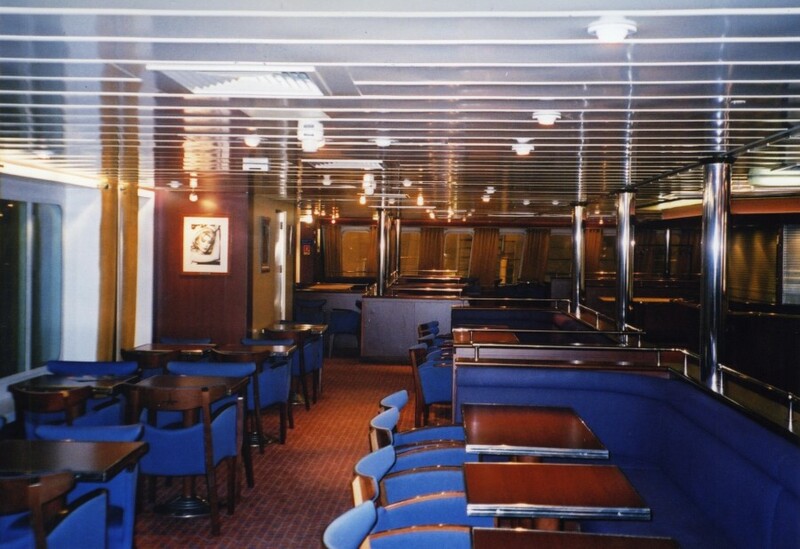 Fakta om Fartyg has a mid-90s deckplan here (the ship was essentially unchanged up to the recent refit. 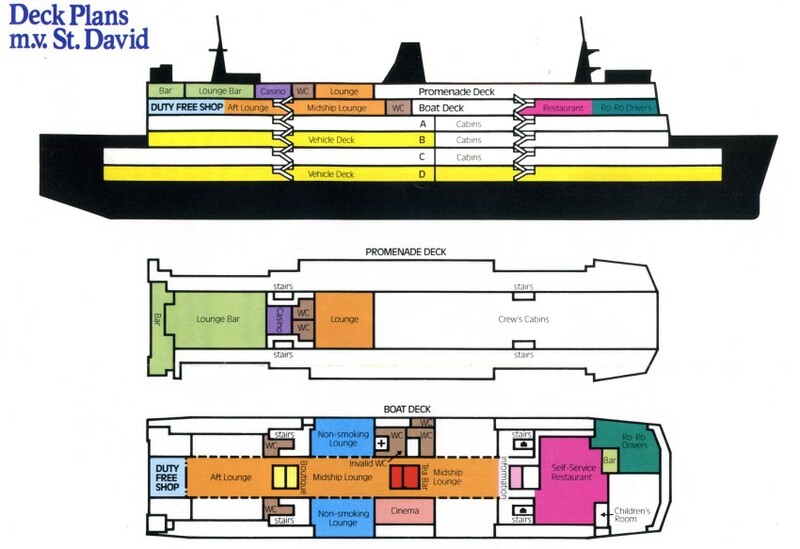 A plan of the ship as St David can be found here. Starting forward, the former Pantry self-service has become Food City, although the layout is essentially unchanged. Looking across from the starboard side, pre-refit. The small Ro-Ro drivers' lounge adjacent to the self-service has so far not been refurbished. 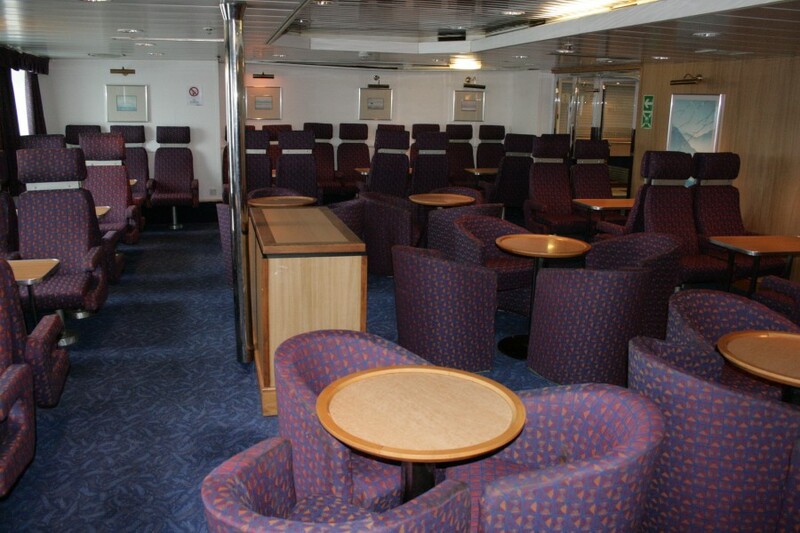 ... now a seating area. The forward section of the old Motorists' Lounge, amidships to starboard. 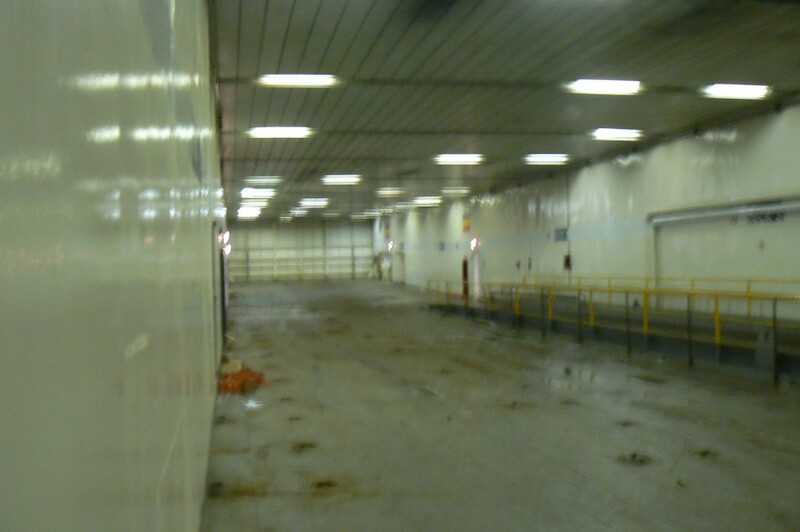 The scene now is virtually unrecognisible as the partitions have been stripped away and the space completely opened up. 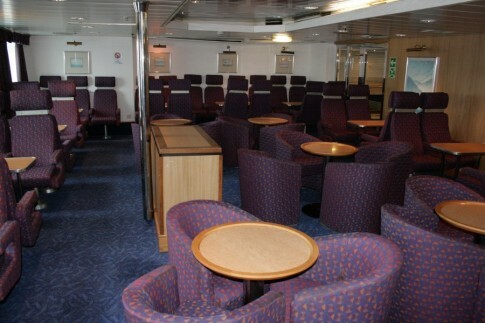 Another view of the pre-refit Motorists' Lounge. The amidships/forward port side lounge, pre-refit. This is now the Barista Lounge Quiet Area. The new, centrally located, Barista Coffee servery - this only seems to be used on busier sailings. 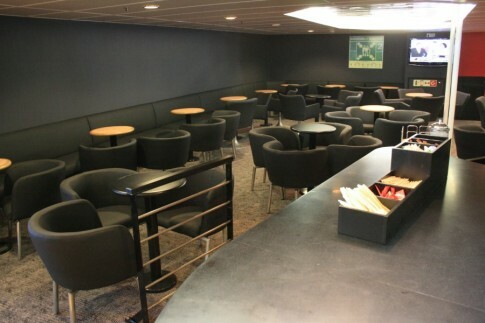 The Barista 'black' area, formerly part of the Motorists' Lounge. 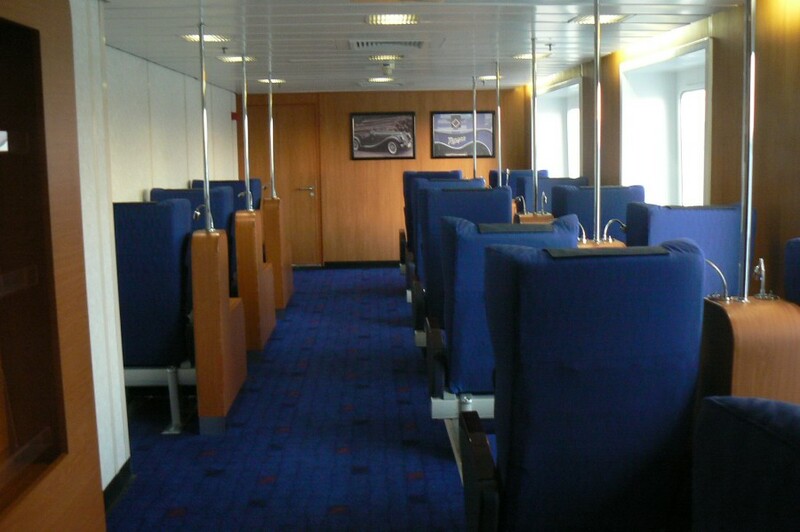 An overall view, looking forward (on the starboard side). 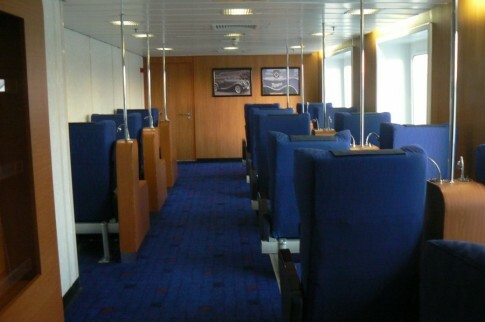 An overall view, looking forward (on the port side). 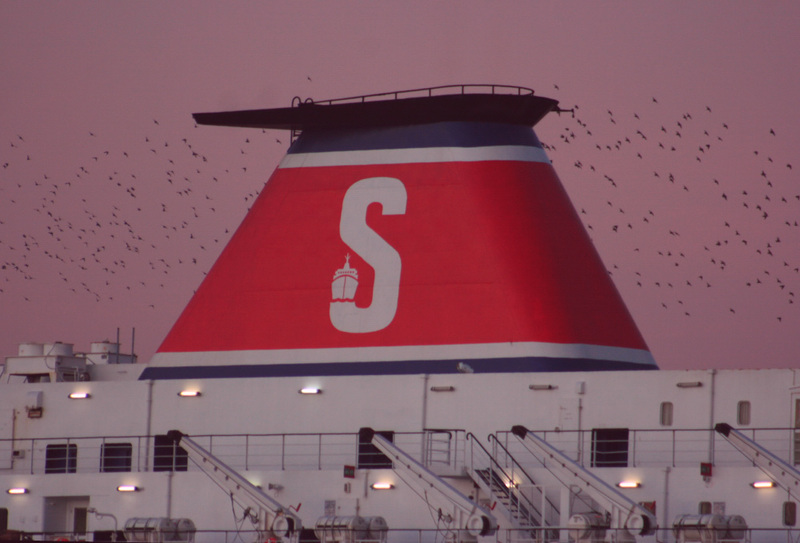 ... is now Stena Plus. 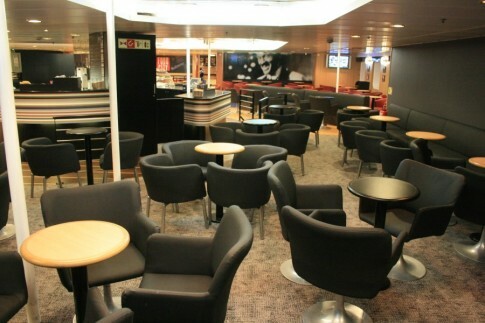 Another view of the new Stena Plus Lounge. 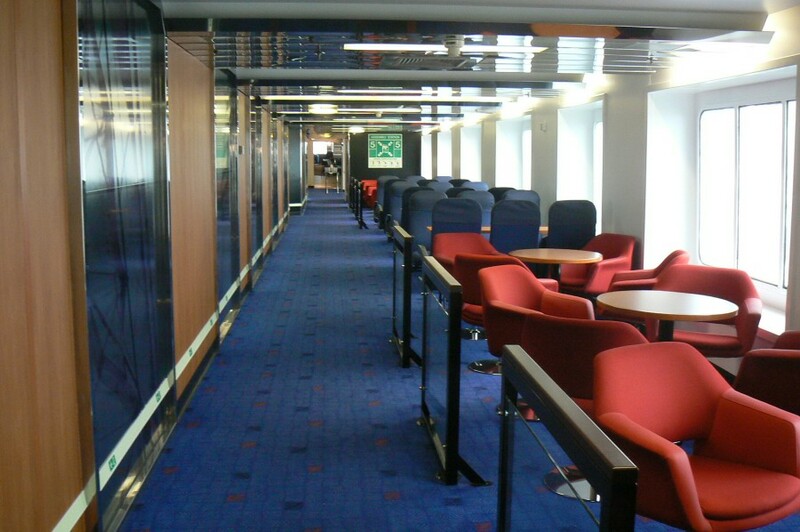 Adjacent to what is now Stena Plus was previously further fixed seating. This is now home to the new Information desk and the Barista Lounge 'family area'. An overall view looking forward before the refit. A view from a similar location now. 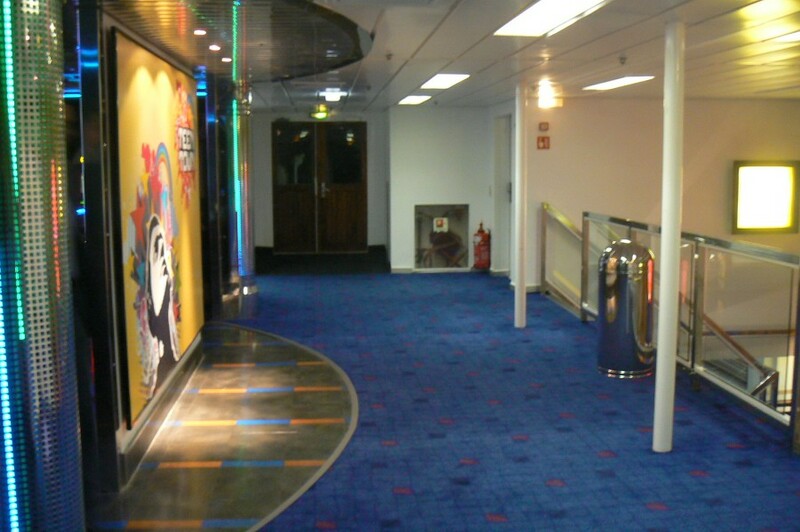 This is now the location of the compact Childrens' play area. 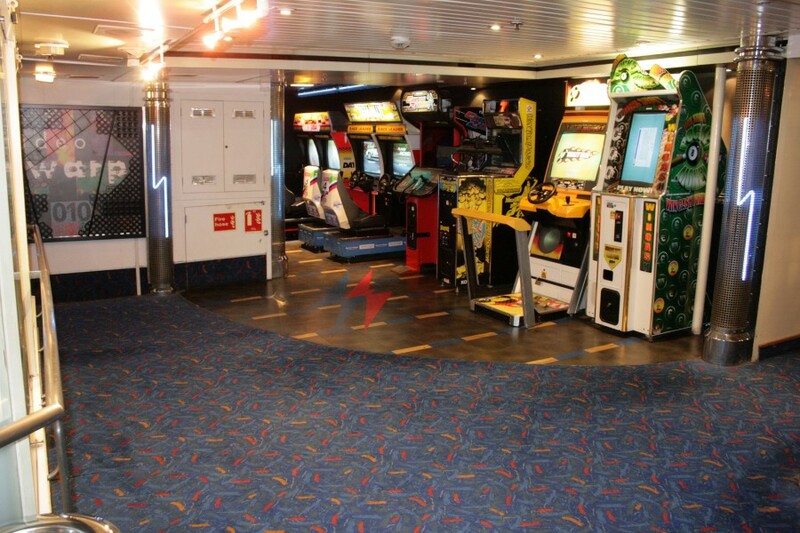 Right aft, the video games area has also been somewhat refitted - here it is before refurbishment. The same area after refit. Looking across to the small shop on the port side, pre-refit. 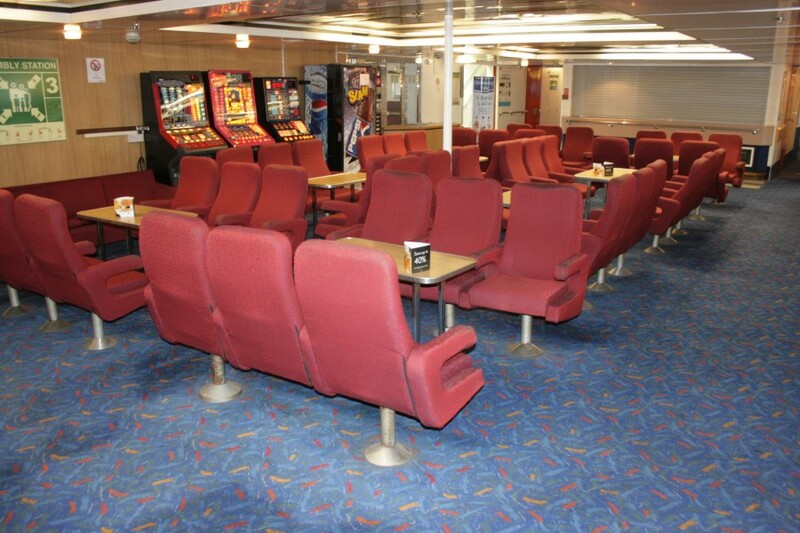 At the stern, the cinema area is largely untouched. Upstairs, the two promenade deck lounges have been slightly tidied up but there has not yet been significant refurbishment. This image shows the aft lounge. 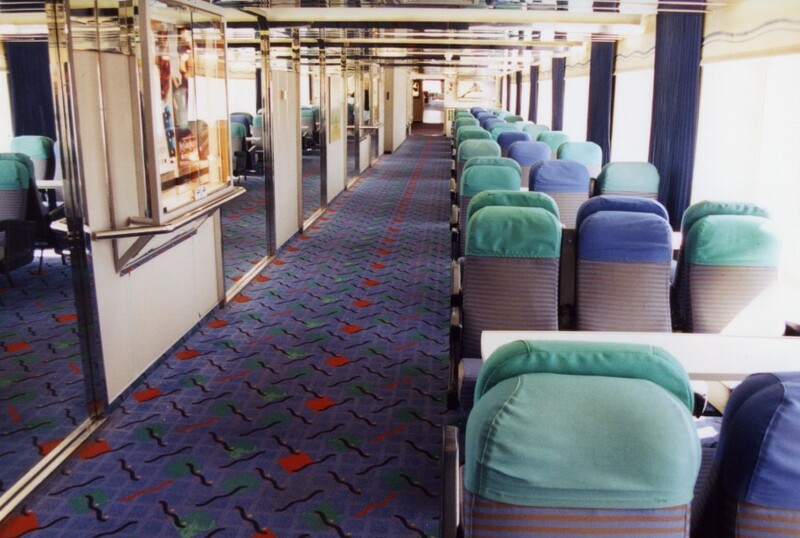 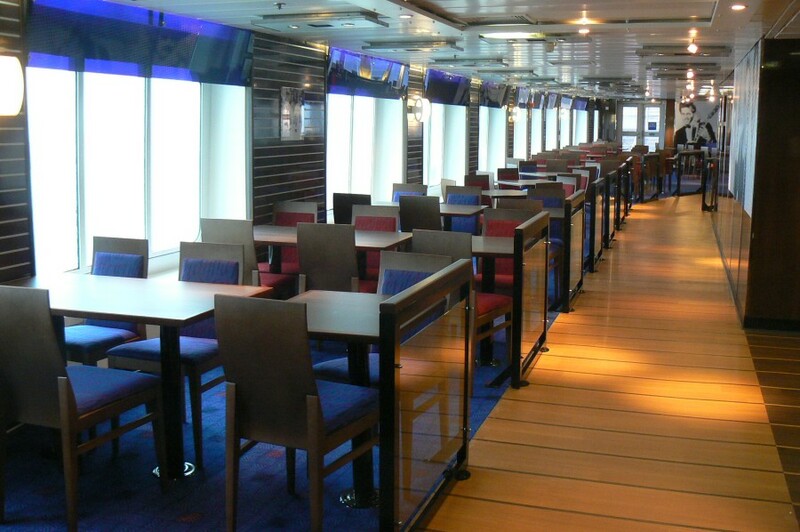 The smaller forward Promenade Deck saloon. 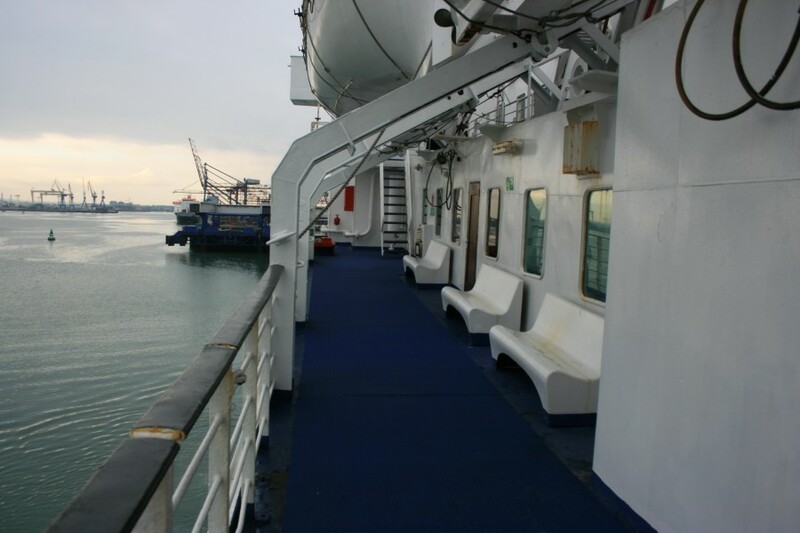 The outside decks were not significantly attended to during the refit. 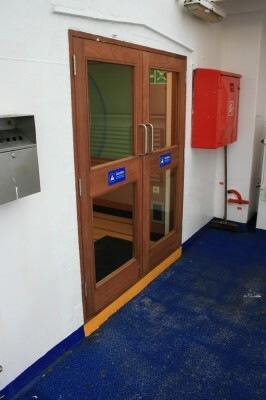 However, new doors leading to the main passenger deck have been installed througout. 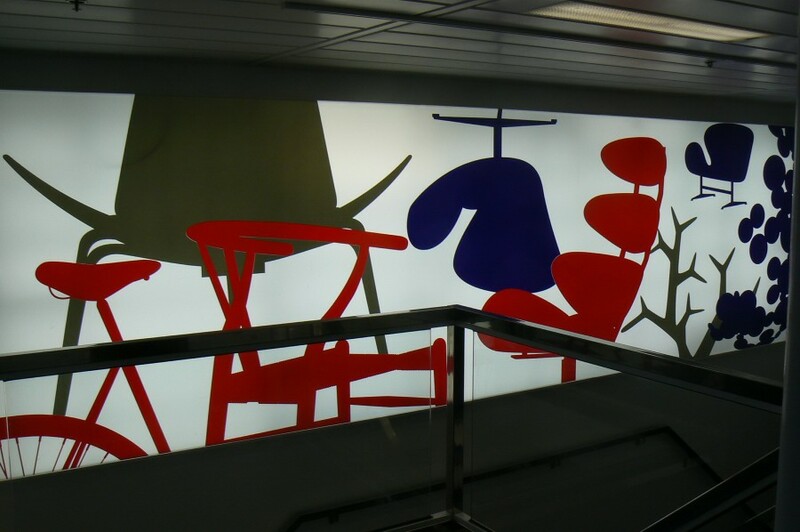 At the top of one of the cardeck stairwells. 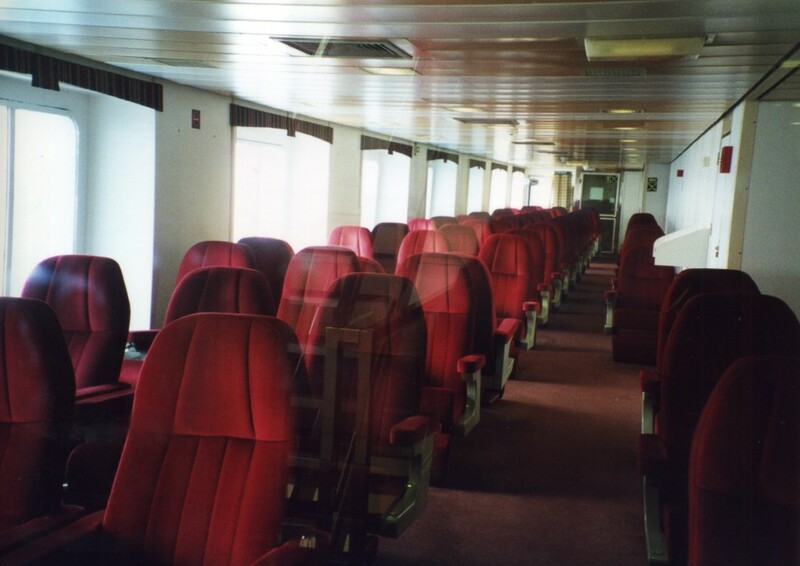 On Deck C, these couchettes are still available for use by freight drivers. 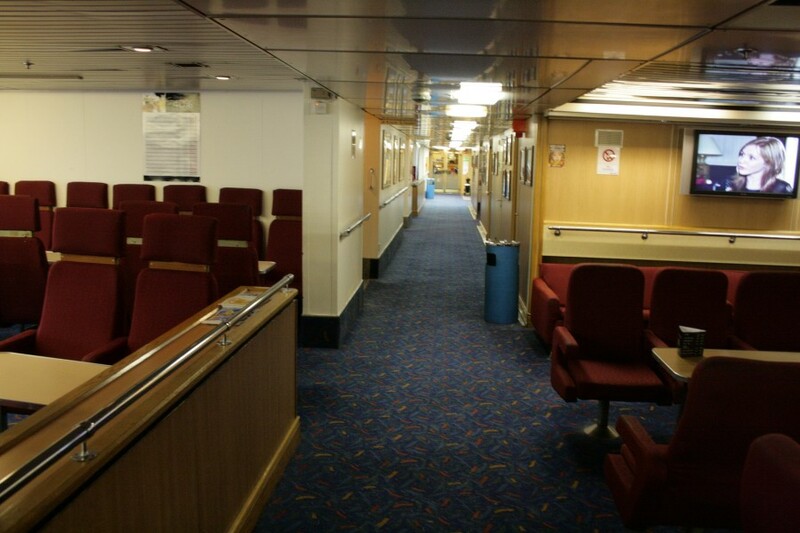 Lastly, an overall view of the upper vehicle deck.